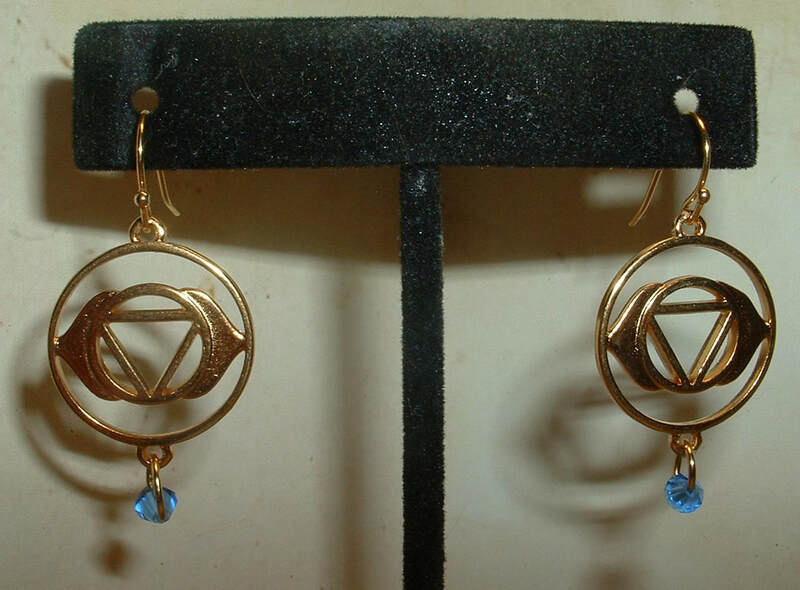 Third Eye Chakra design in 22k gold. 10/14/22k gold filled components. Swarovski Indigo crystal drop. 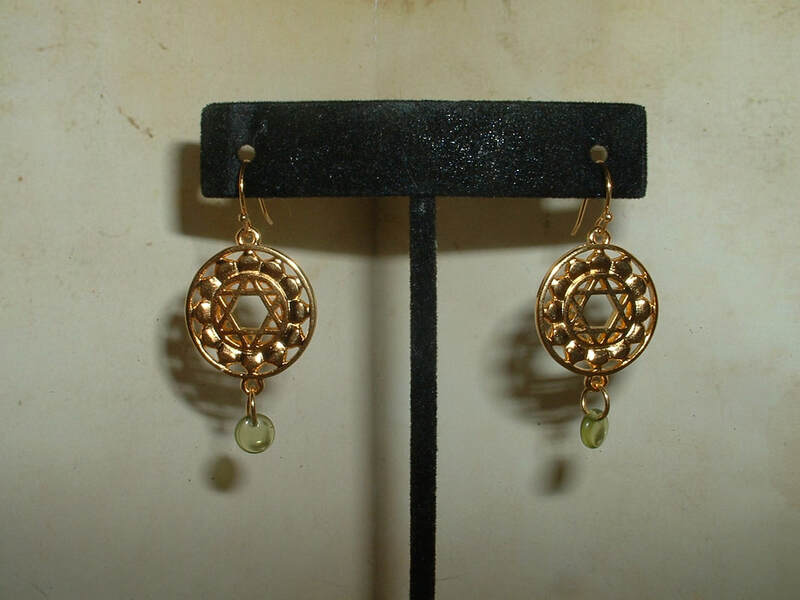 Heart Chakra design in 22k gold. 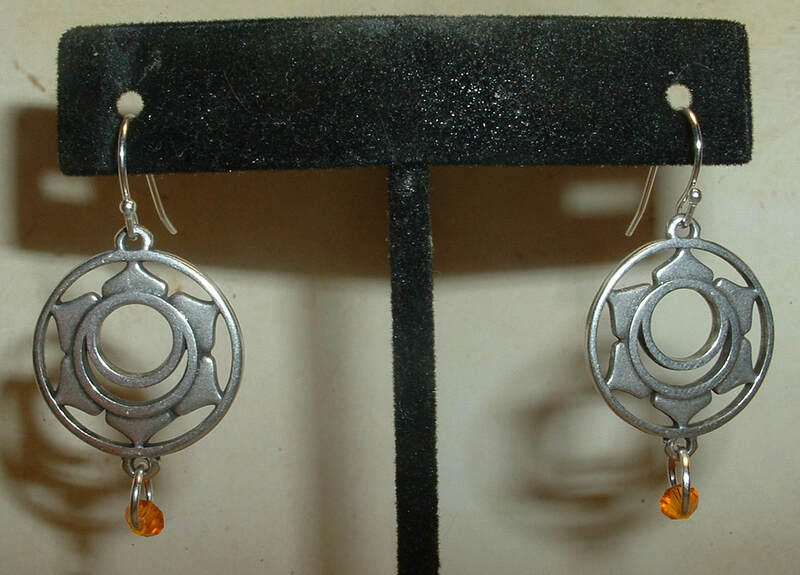 Heart Chakra design in sterling silver. 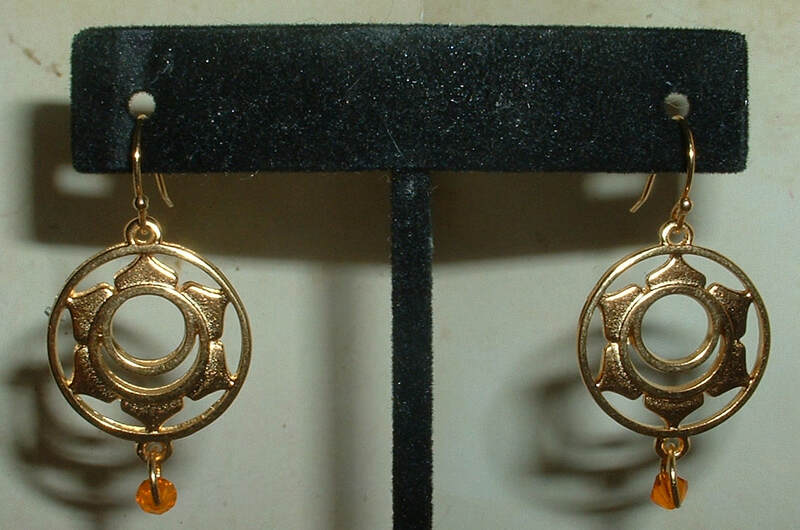 Solar Plexis Chakra design in 22k gold. 10/14/22k gold filled components. 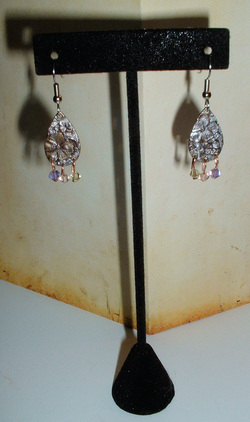 Swarovski Sun crystal drop. 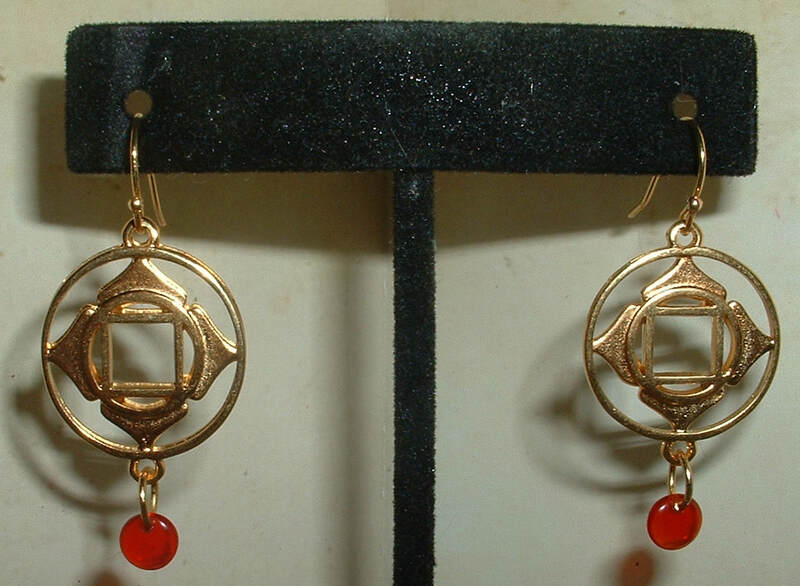 Root Chakra design in 22k gold. 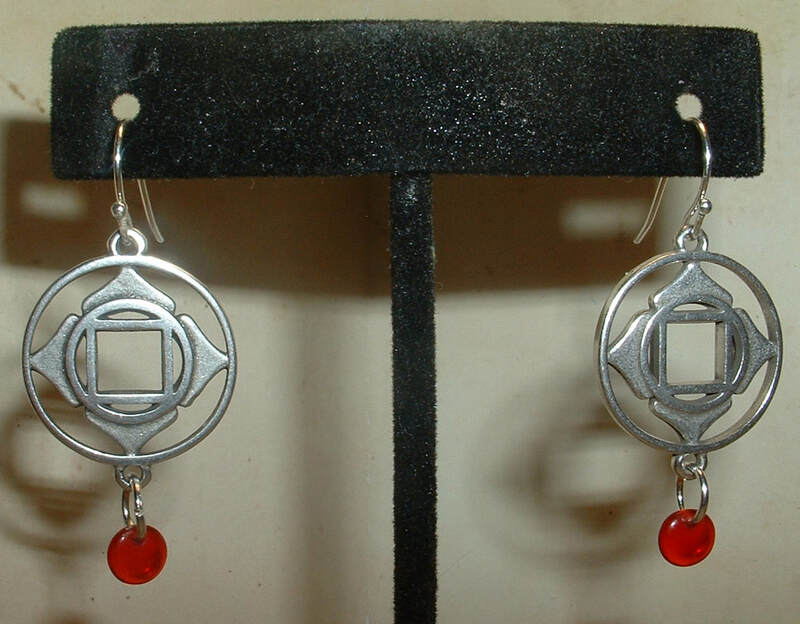 Root Chakra design in sterling silver. Crown Chakra design in 22k gold. 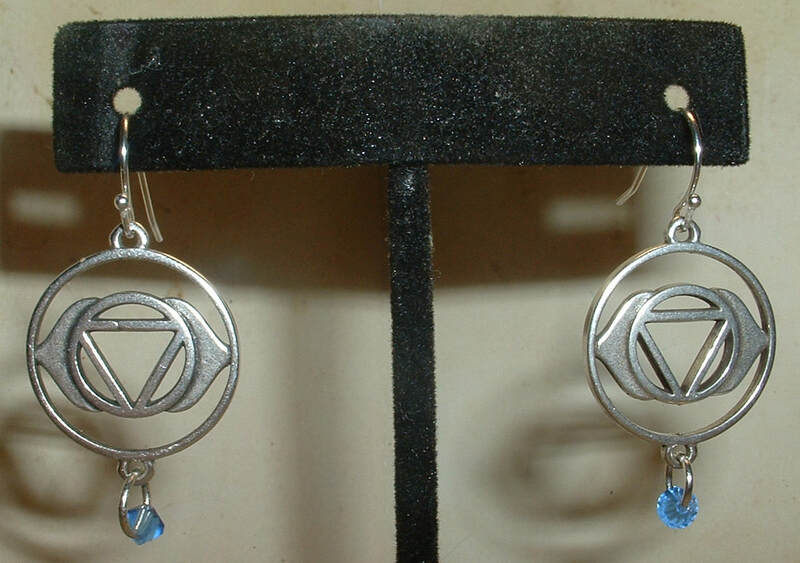 Crown Chakra design in sterling silver. 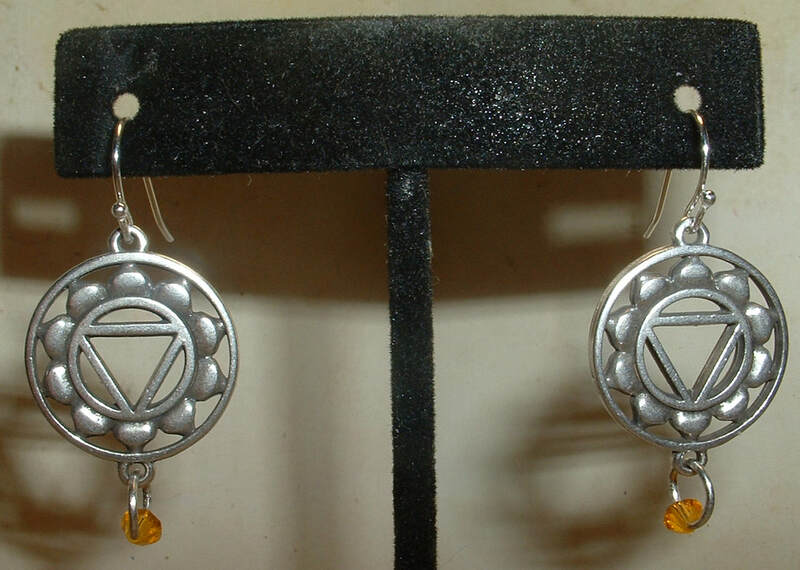 Happiness Chakra design in 22k gold. 10/14/22k gold filled components. 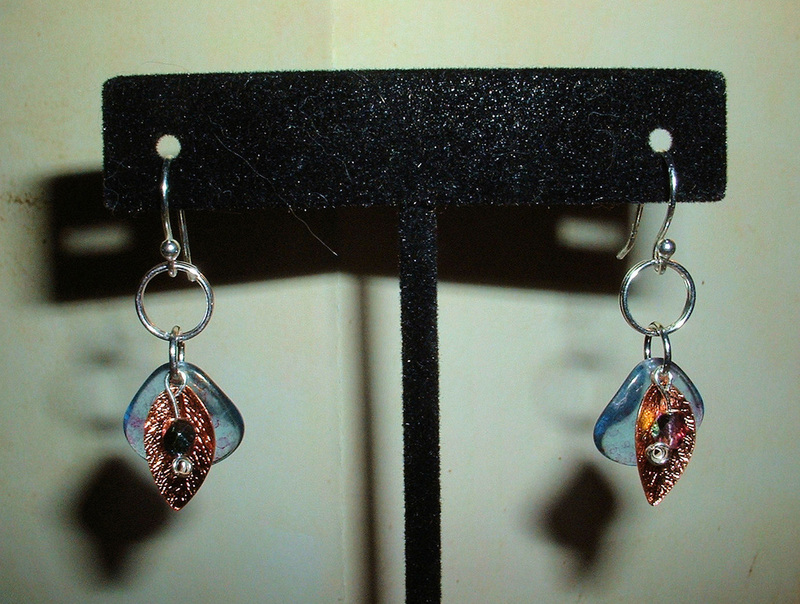 Swarovski Fire Opal crystal drop. ​Swarovski Fire Opal crystal drop. 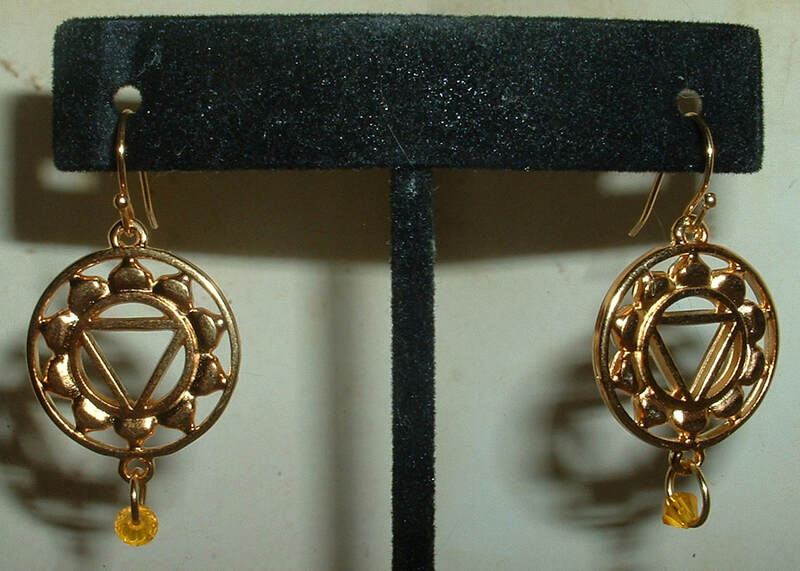 Purity Chakra design in 22k gold. 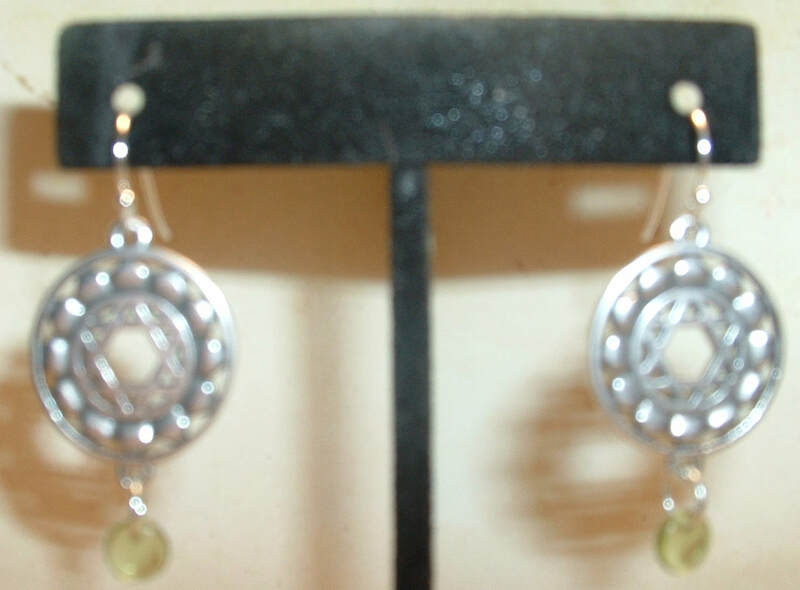 Purity Chakra design in sterling silver. 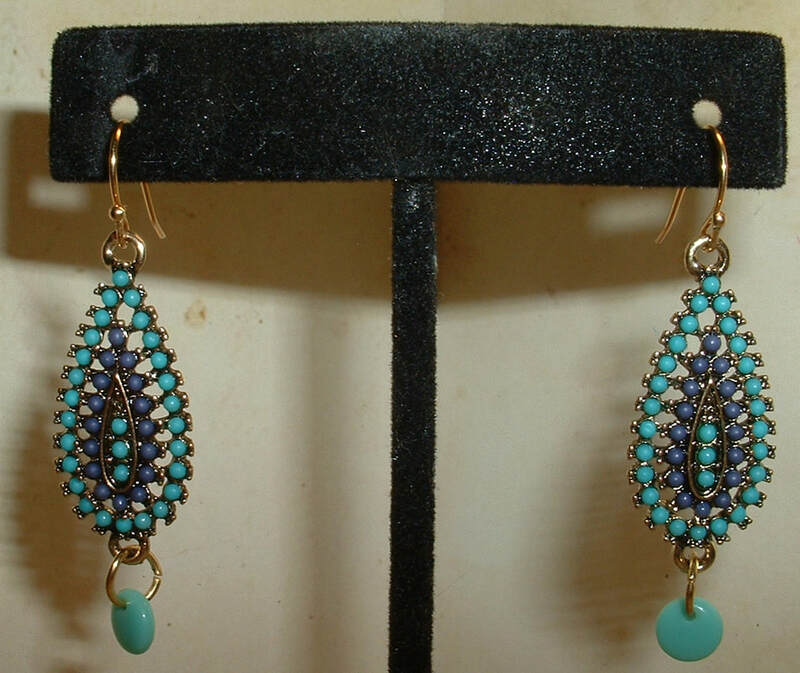 3/4 Zola cut cabachons of Turquoise and Lapis Gemstones within a 22k gold filled setting. 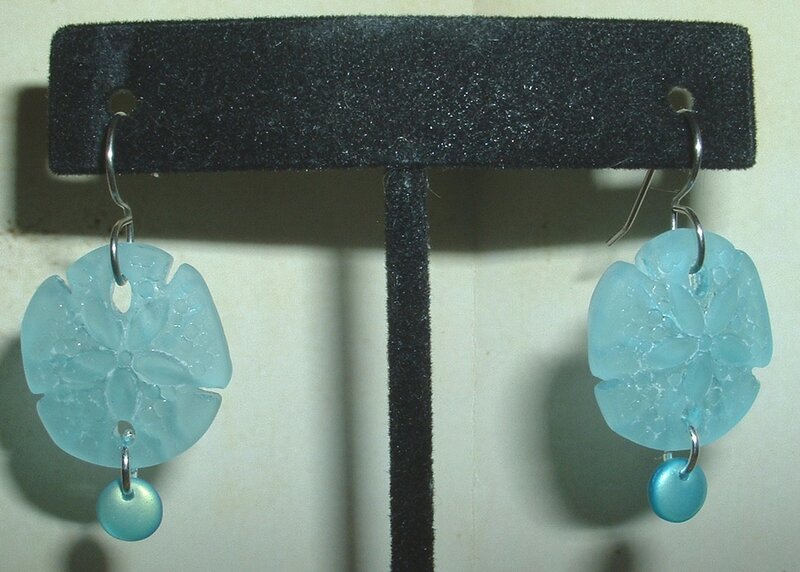 Turquoise gemstone drops. 10/14/22k gold filled components. 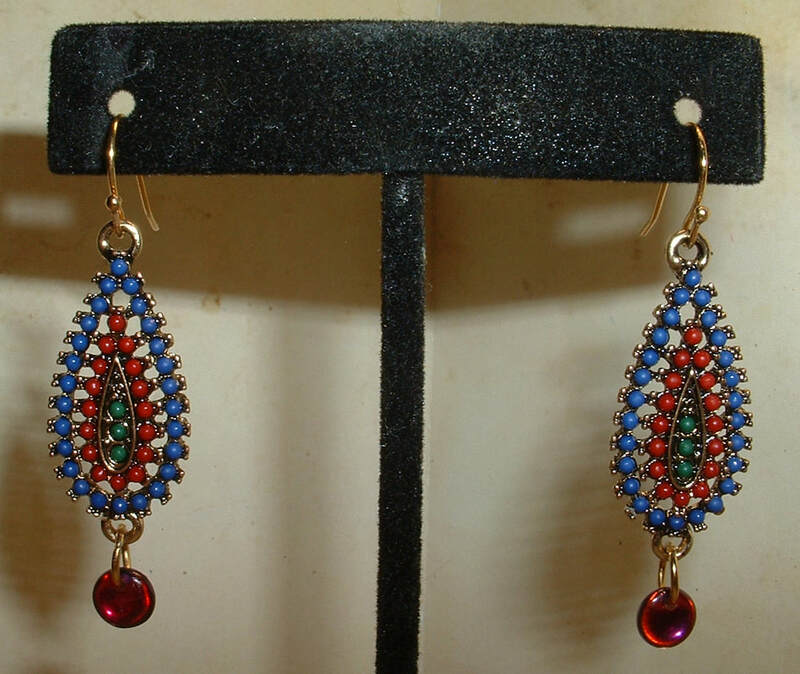 3/4 Zola cut cabachons of Turquoise and Lapis Gemstones centered with a Fuchsia Swarovski crystal within a 22k gold filled setting. 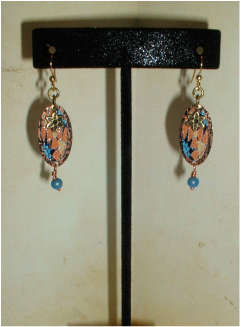 3/4 Zola cut cabachons of Coral, Green Turquoise, Lapis Gemstones within a 22k gold filled setting. Gold glazed Ruby drops. 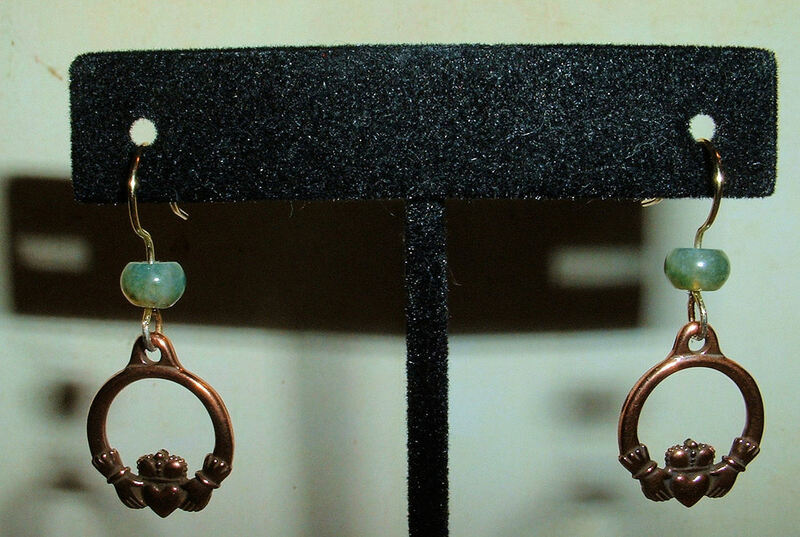 Sculpted Copper filled double sided Lotus charms with Turquoise drops. 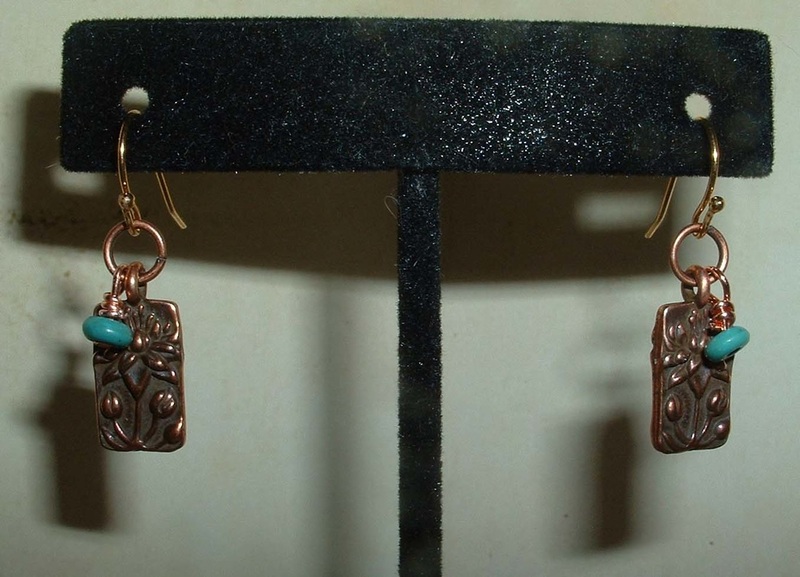 Close-up of Copper Loti Earrings. 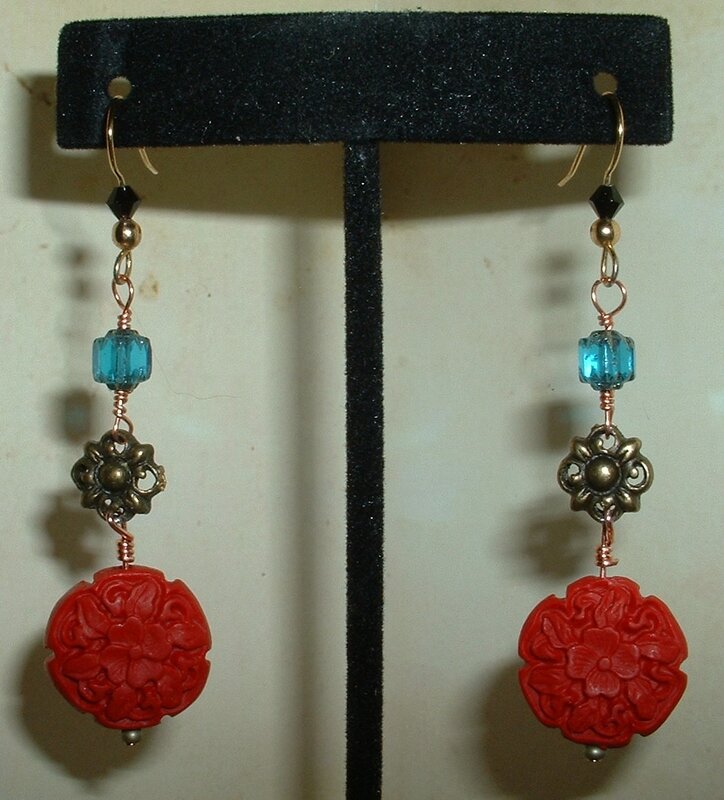 Double-sided carving into Red Coral with a nature design, Bronze flower connector bridges the carving to the Swarovski elements. 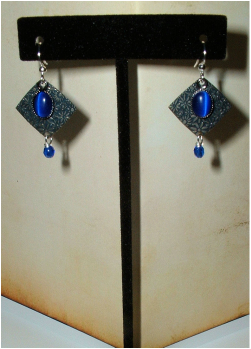 Onyx, Gold & Sterling dipped Blue Topaz Swarovski crystal beads. Copper wire work. Double sided laser engraved Brass jardin drops layered with Bronze gecko design. 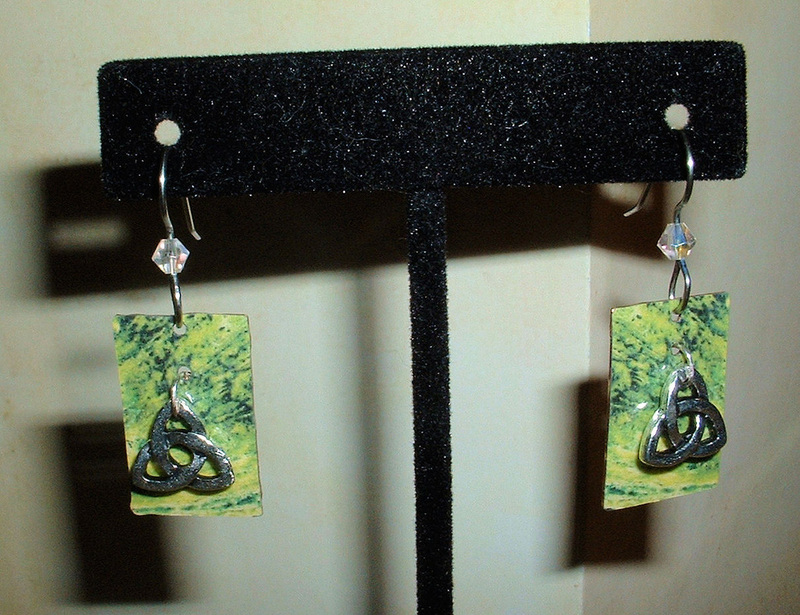 Close Up of Gecko Earrings. 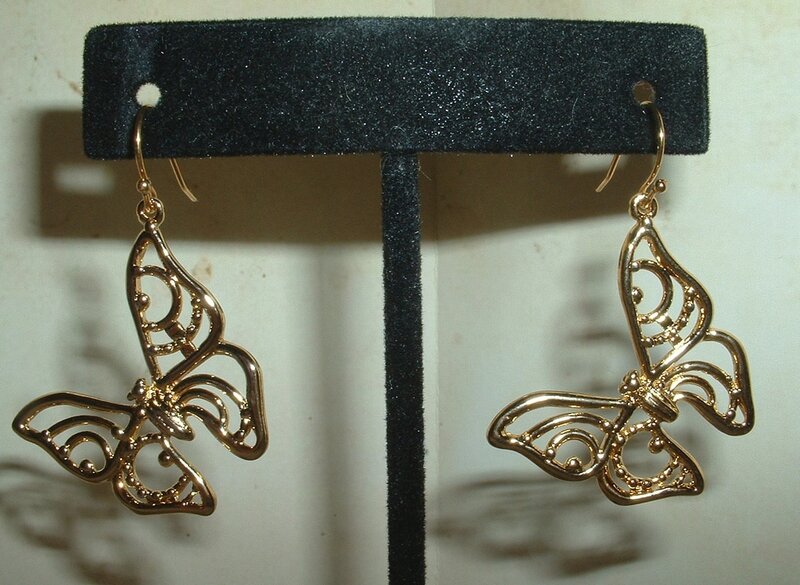 Double sided laser cut & laser engraved 22k Gold filled butterfly design. 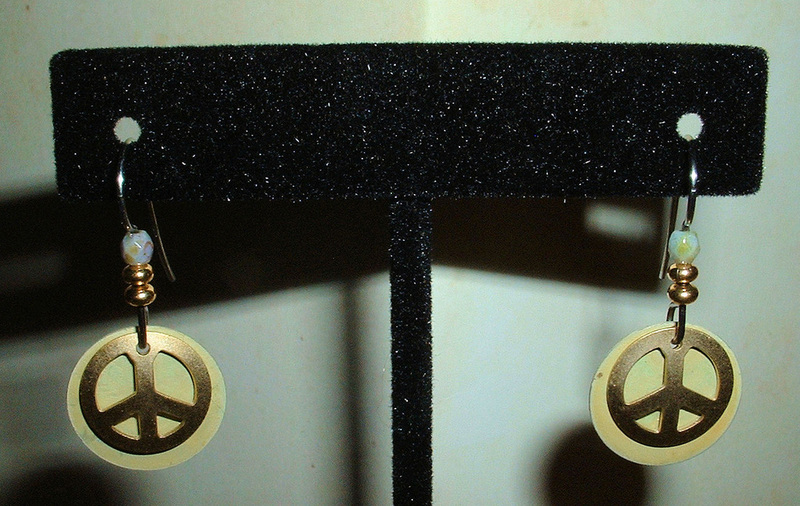 Close Up of Mighty Wings (gold) Earrings. Double sided laser engraved Brass jardin drops layered with Bronze wasp design. 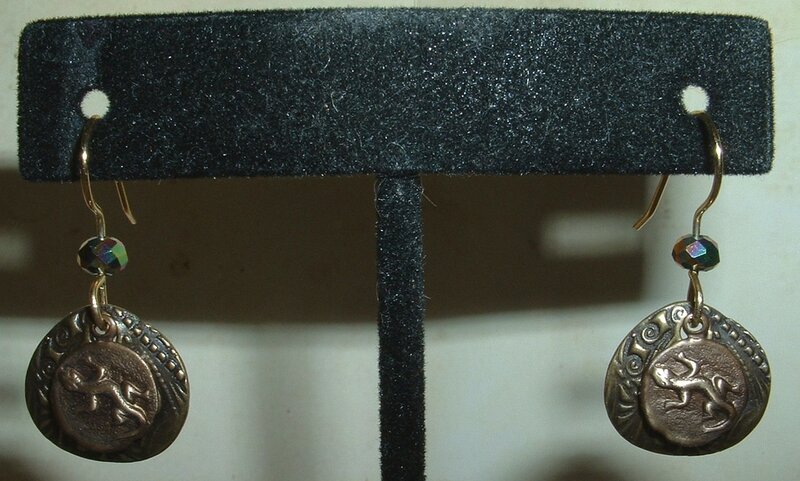 Close Up of Wasp Earrings. 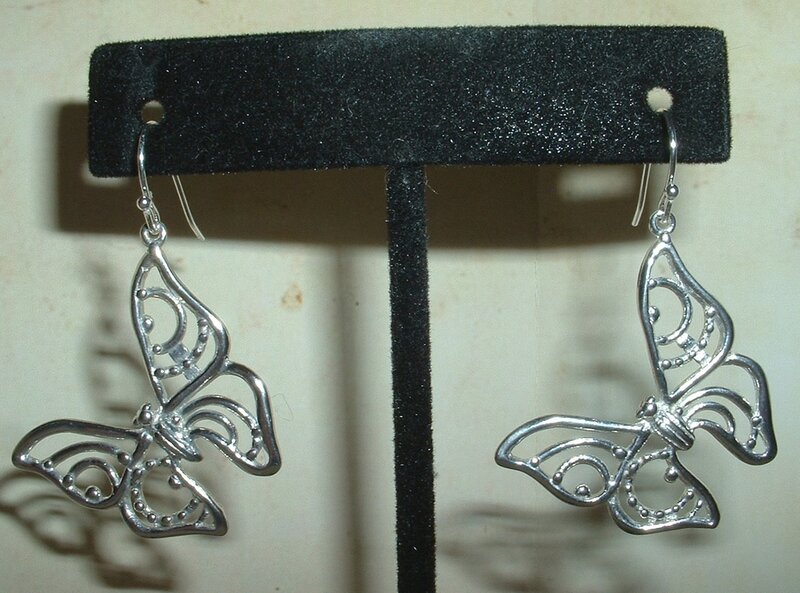 Double sided laser cut & laser engraved Sterling filled butterfly design. 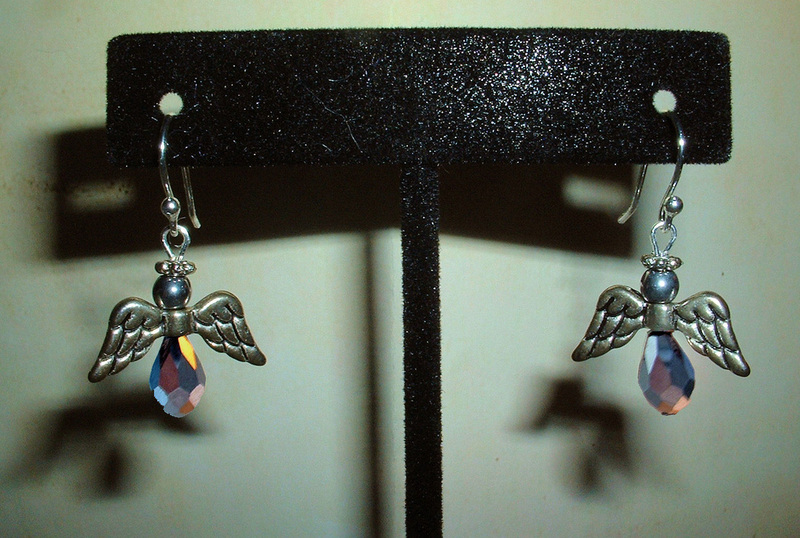 Close Up of Mighty Wings (sterling) Earrings. Double sided laser engraved Brass jardin drops layered with Bronze turtle charms. 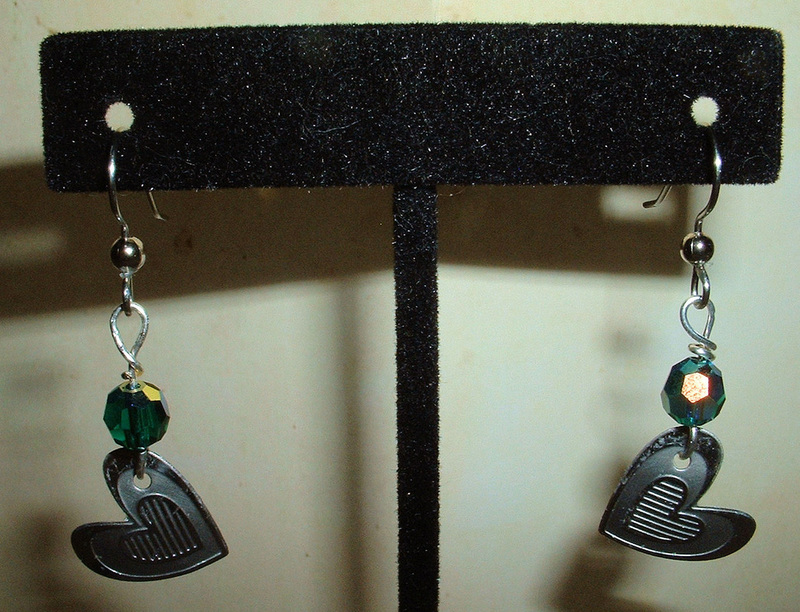 Close Up of Turtle Earrings. Aged Copper discs layered w/Gold Eternity Knots dangle below Connemara Marble beads. 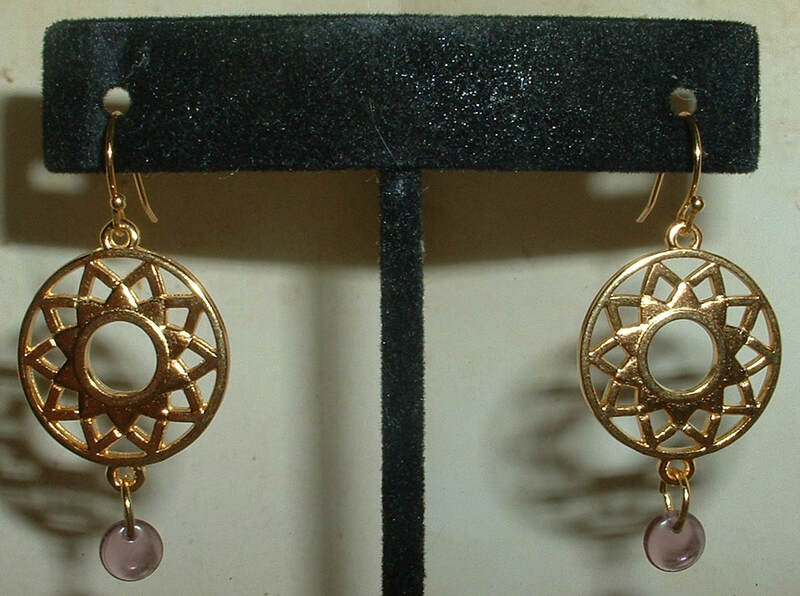 14k Gold Filled Claddaghs with faceted Amethyst beads. 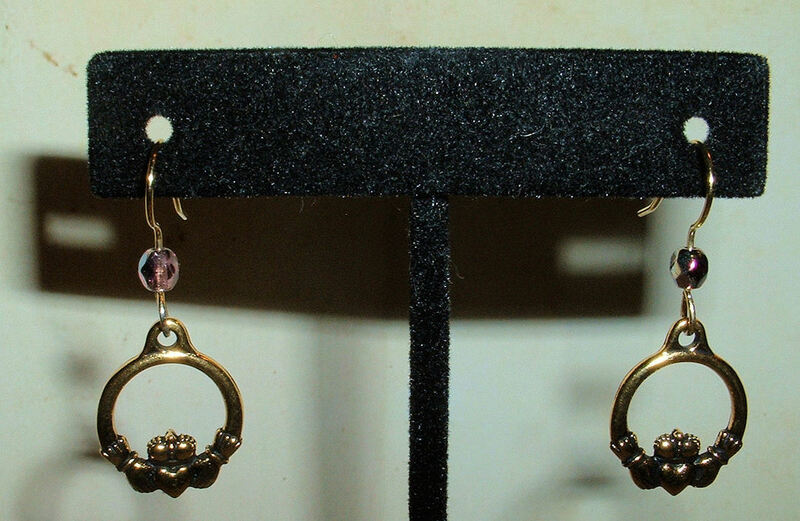 Close Up of Gold Claddagh Earrings. 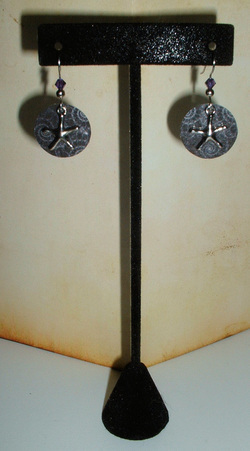 Hammered Bronze drops lithographed with artisan rendering layered w/Italian Silver Trinity Knots, Sterling wirework. 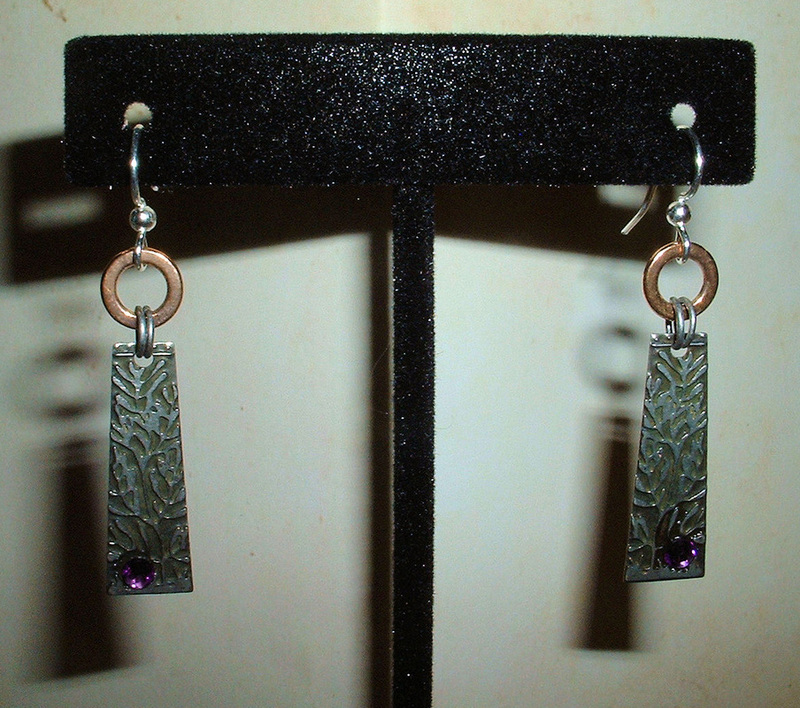 Copper filled Claddaghs with hand-cut Connemara Marble beads. 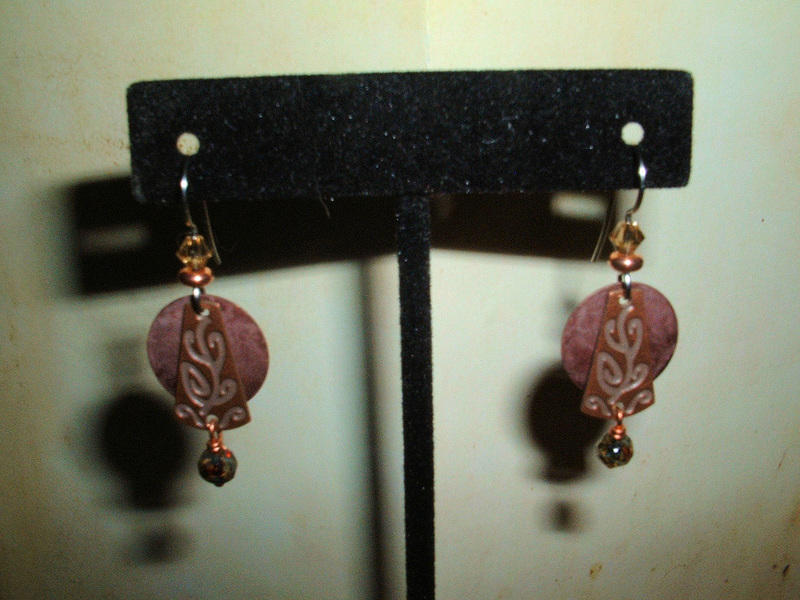 Close Up of Copper Claddagh Earrings. Using Organic Florida Sea Glass purchased to benefit our natural preserves. Hand carved Everglades organic sea glass w/Haitian Tiger's Eye beads. 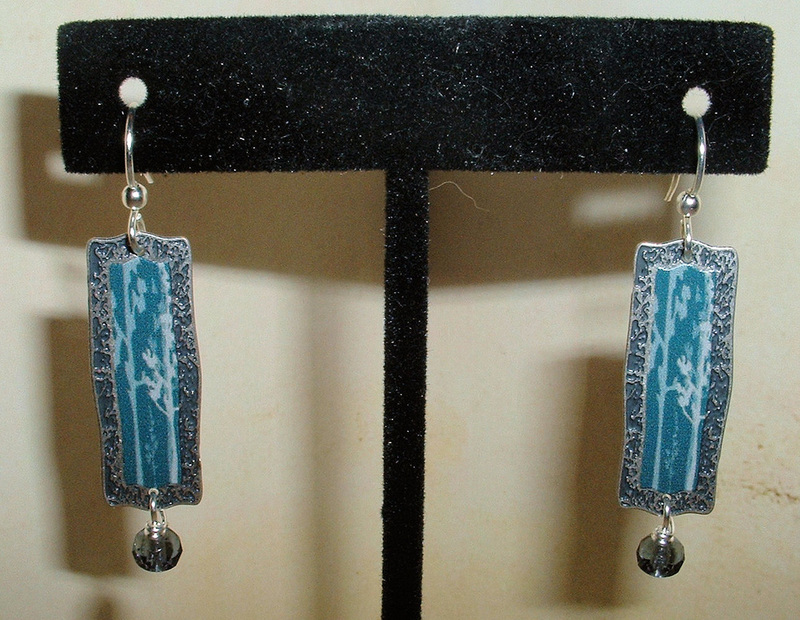 Hand carved Channelside organic sea glass w/Smokey Blue Topaz drops. 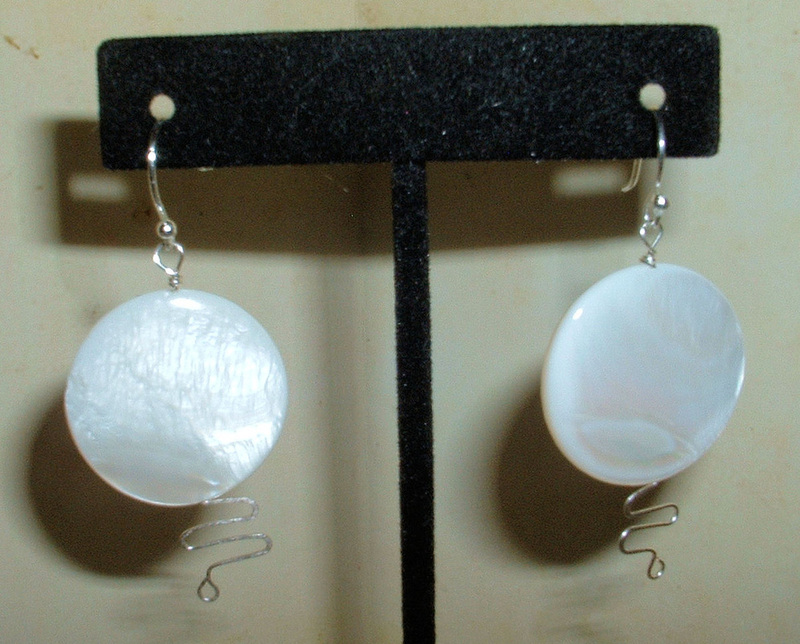 Close Up of Channelside Sand Dollars Earrings. 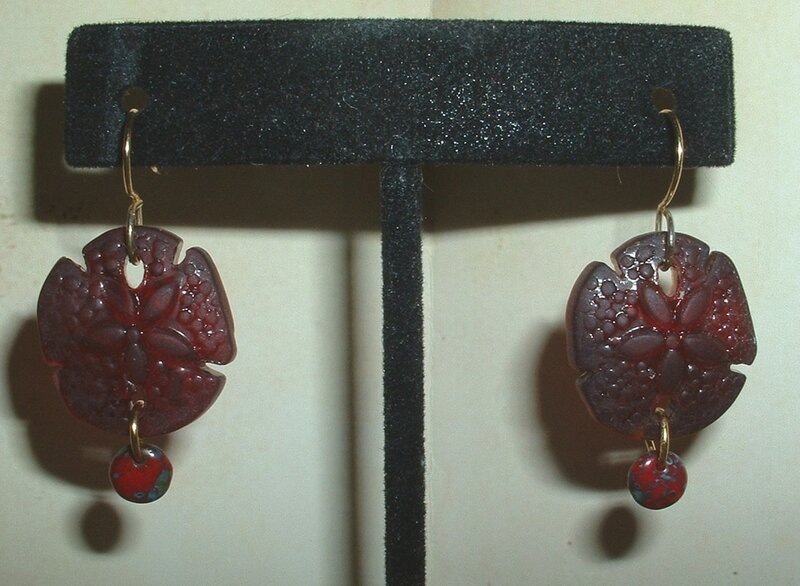 Hand carved Red Algae organic sea glass w/Picasso Ruby drops. 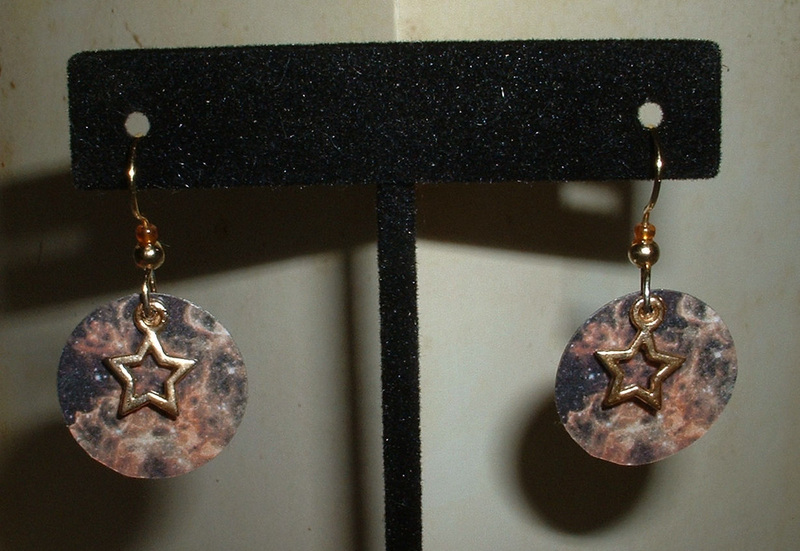 Close Up of Red Algae Sand Dollars Earrings. 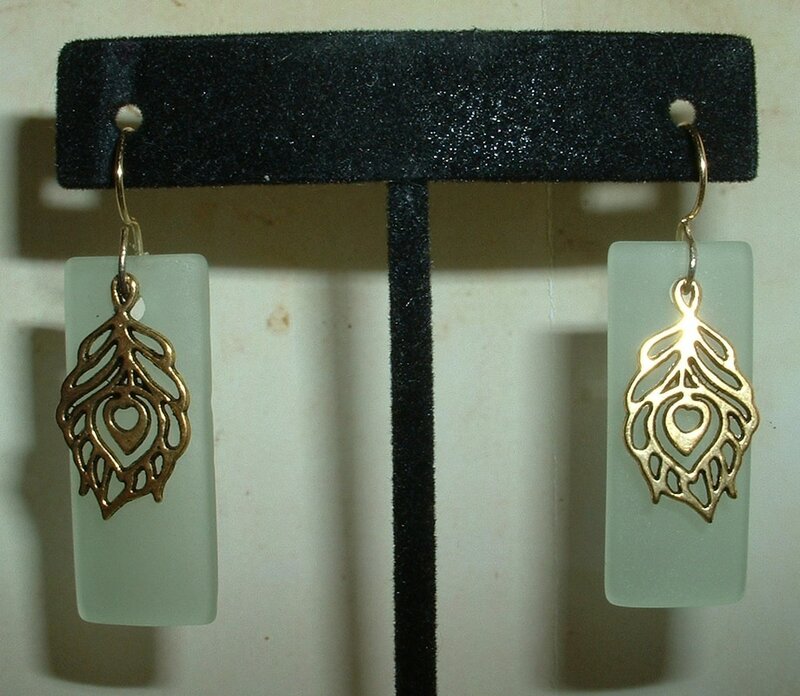 More Sea Glass designs available in the Fine Feathered & Flying Collection!!! Laser cut & laser engraved antique Sterling design. 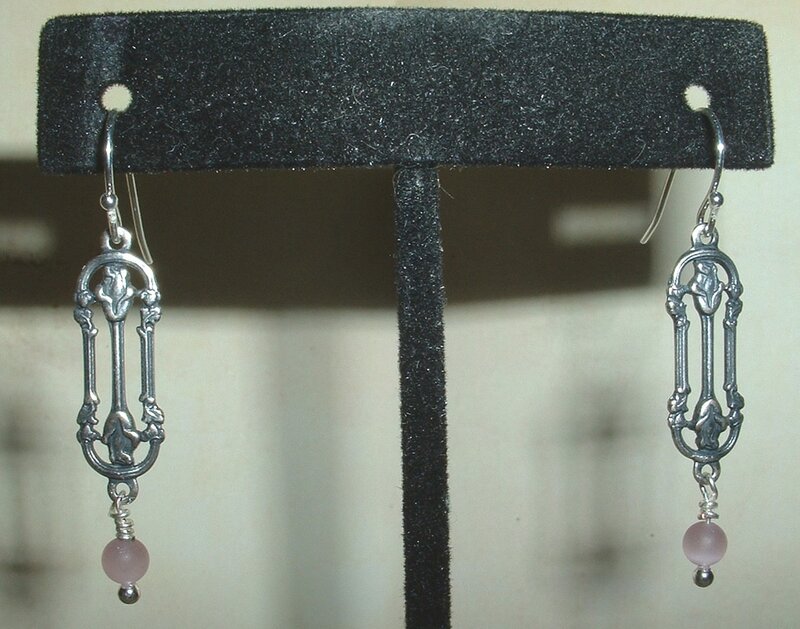 Close Up of Nouveau Rose Earrings. 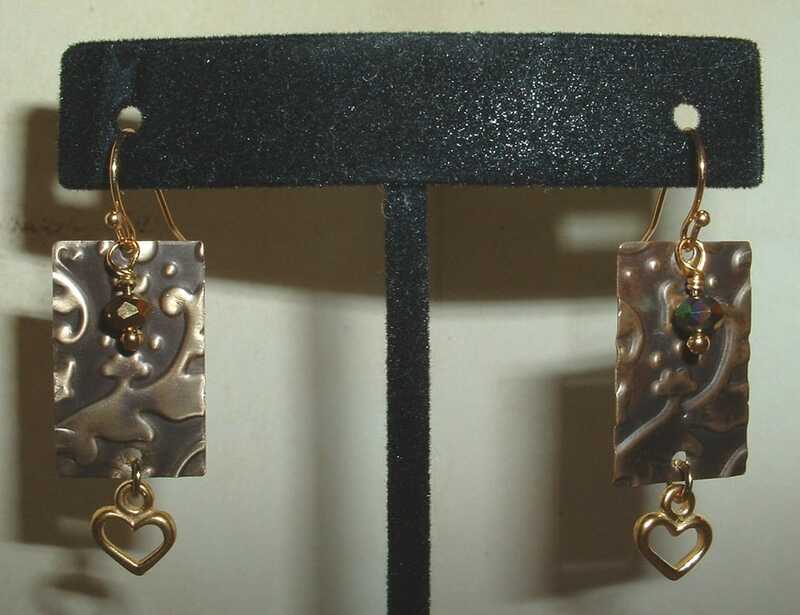 Embossed & rubbed Bronze rectangles w/22k Gold filled open heart drops. 14k Gold filled wire work. 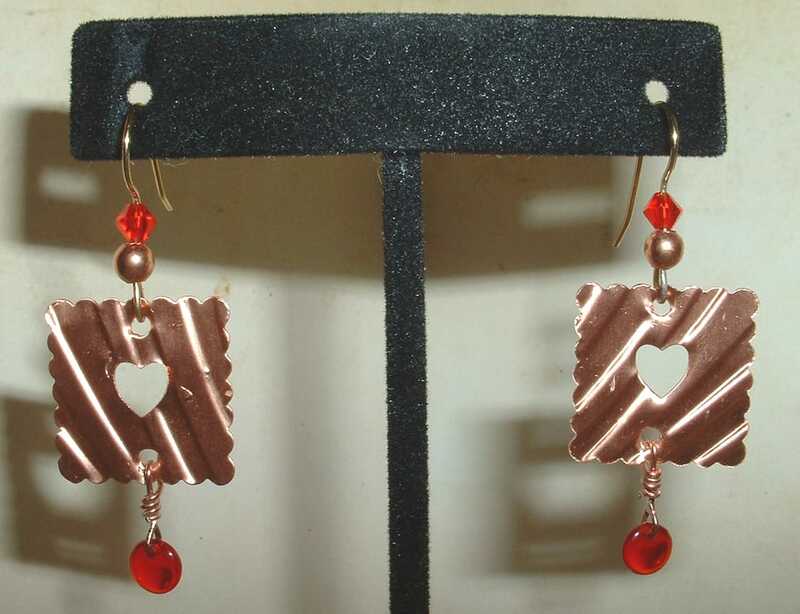 Close Up: Open Hearts Earrings. 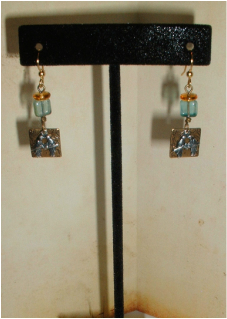 Laser embossed brass squares layered with Silver Lovebird charms, Aquamarine and Citrine beads. ​Laser etched Stainless Steel hearts. Swarovski Aurora Emerald & Sterling beads. Laser cut & embossed Copper squares with Ruby drops. Close Up: Rustic Love Earrings. Silkscreened design on a brass heart layered with gold sunflower charms. 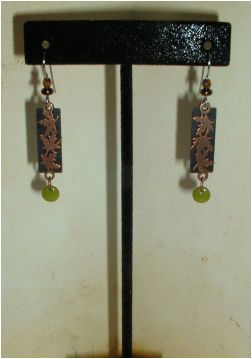 Laser cut, laser etched & hammered rectangles of Copper layered with Sterling Silver feather charms. Close Up ...Of a Feather Earrings. 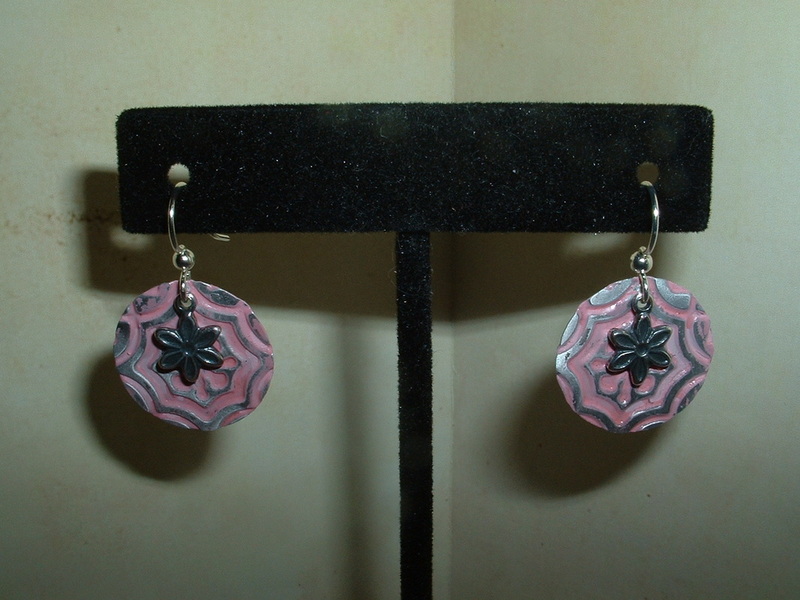 Enameled Brass drops layered with laser engraved Sterling dragonflies. 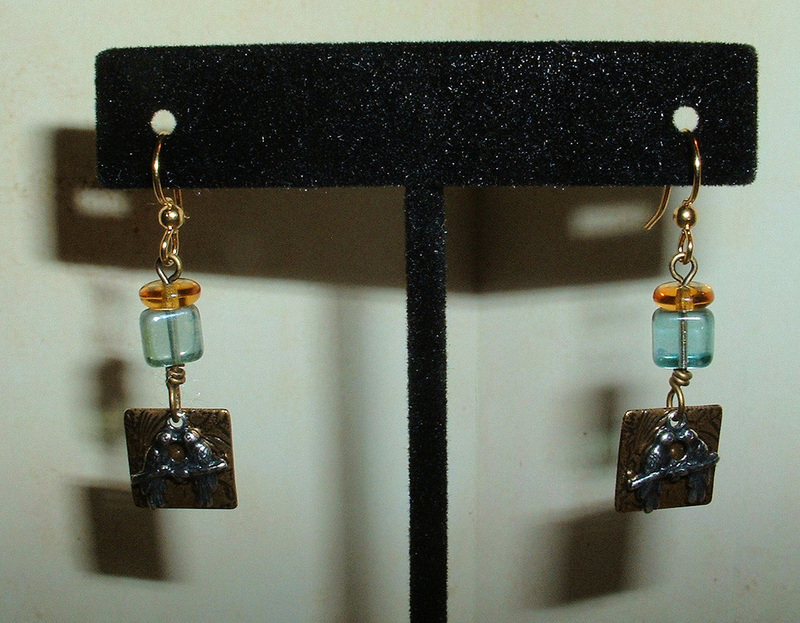 ​Faceted Labrodite & Turquoise beads. ​Tumbled Mountain Sapphire drops with Sterling links. 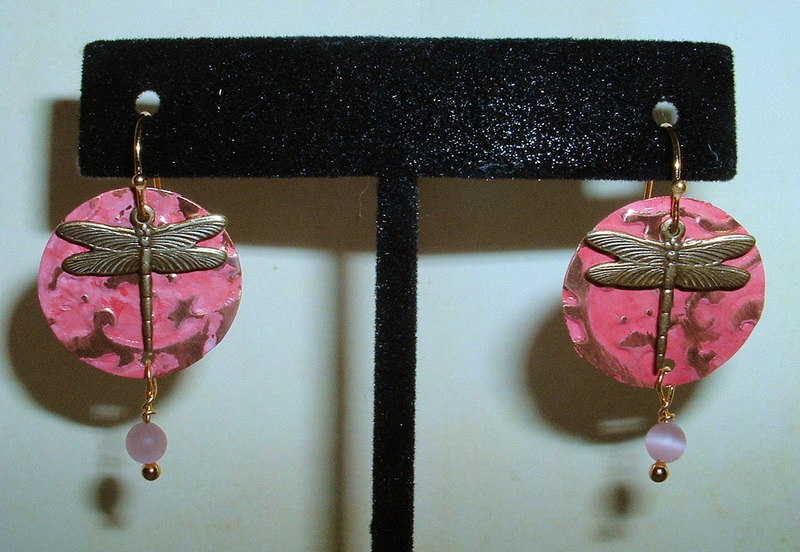 Close Up of Odonata Earrings. Embossed & Enameled Copper discs layered with laser etched Gold dragonflies. Finished with Italian Tiger's Eye beads. 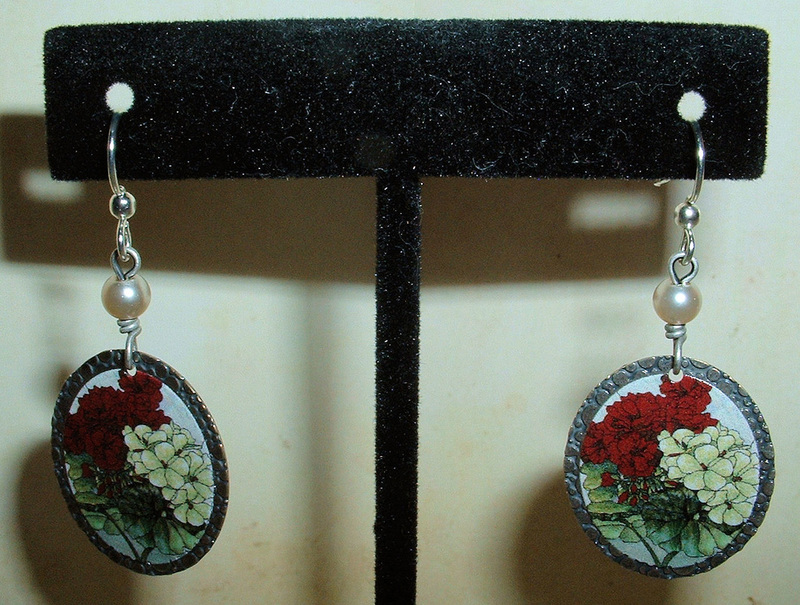 Close Up: Bergenia Dragonfly Earrings. Laser cut 22k Gold peacock feather design layered with hand cut Florida Everglades sea glass. 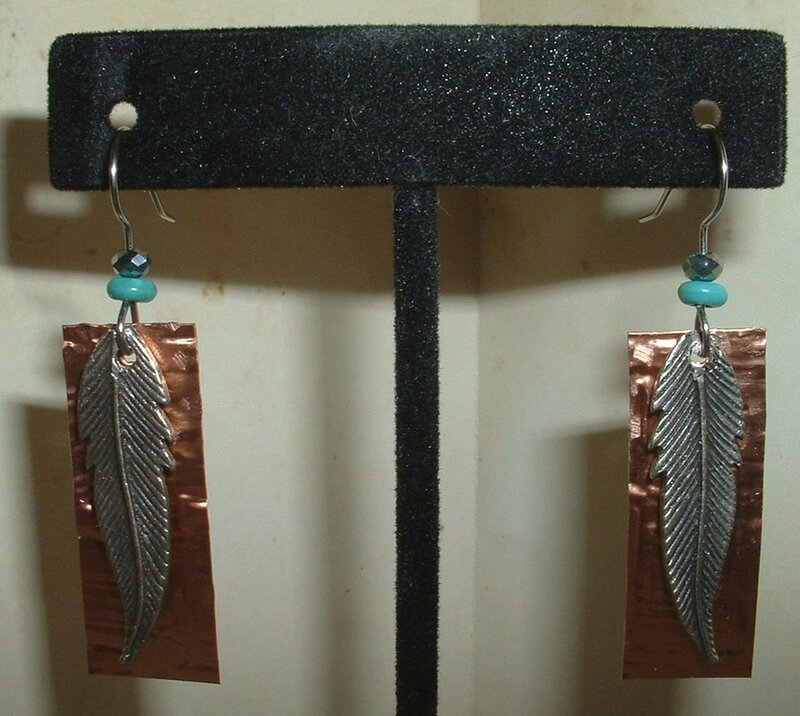 Close Up of Everglade Peacock Feathers Earrings. Embossed & Enameled Brass discs layered with laser etched Gold dragonflies. Finished with Jade & Brass beads. 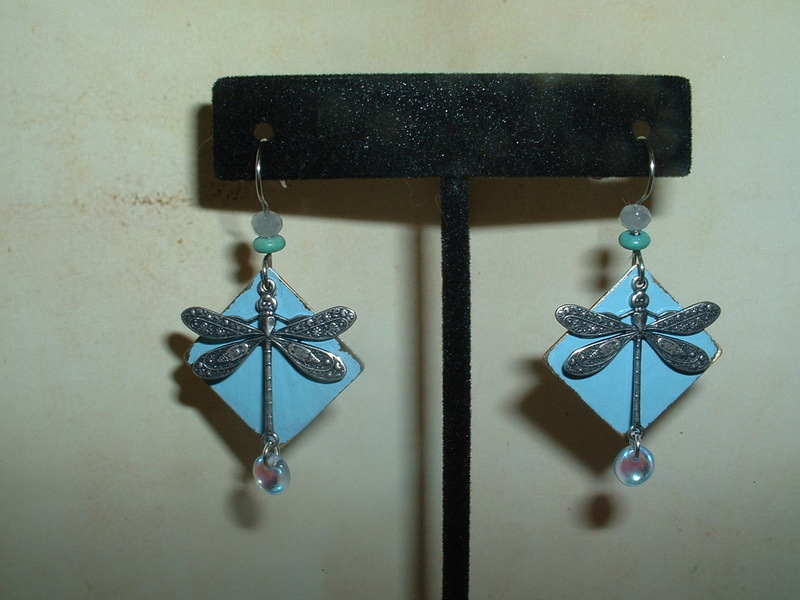 Close Up: Emperor Dragonfly Earrings. Unique hammered Copper discs lithographed w/artisan rendering, layered w/Italian Silver butterflies, Sterling wirework, Swarovski Onyx & Rose Crystal beads. Laser cut & Laser etched 10k Gold filled drops in a honeycomb designed are layered with sculpted Brass bees. 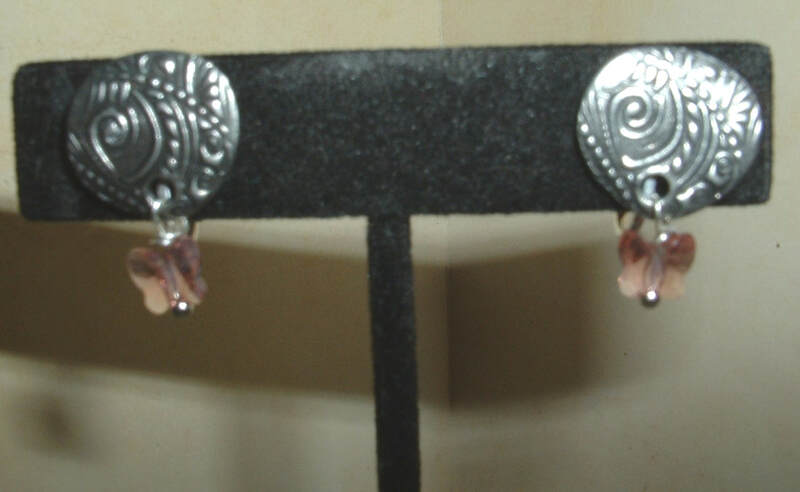 ​An assortment of Amethyst, Smokey & Quartz crystal beads dangle from a petite silver chain. 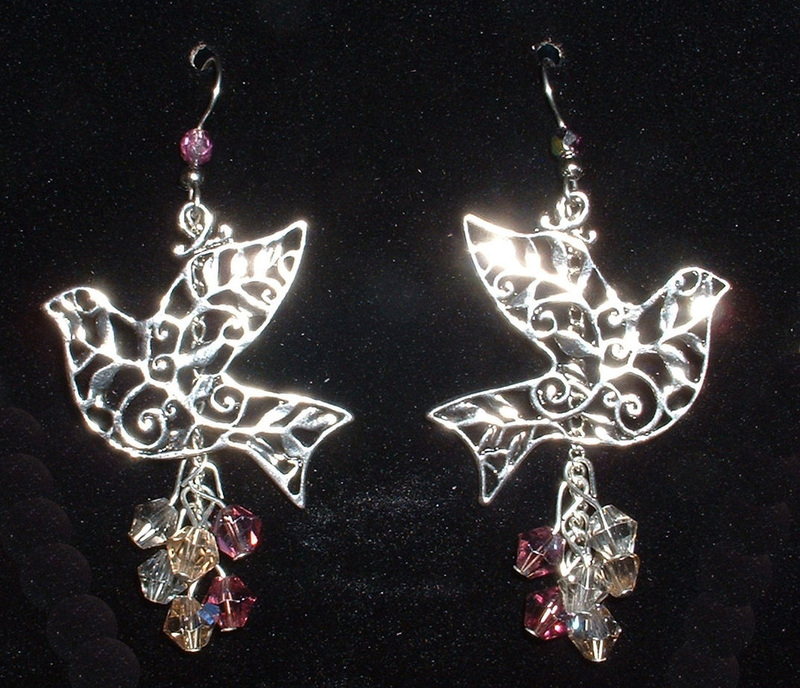 Layered with stainless steel filigree doves. Cut Amethyst & Sterling beads. 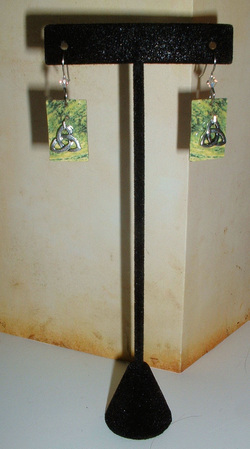 Embossed and Hand Painted Brass Earrings. 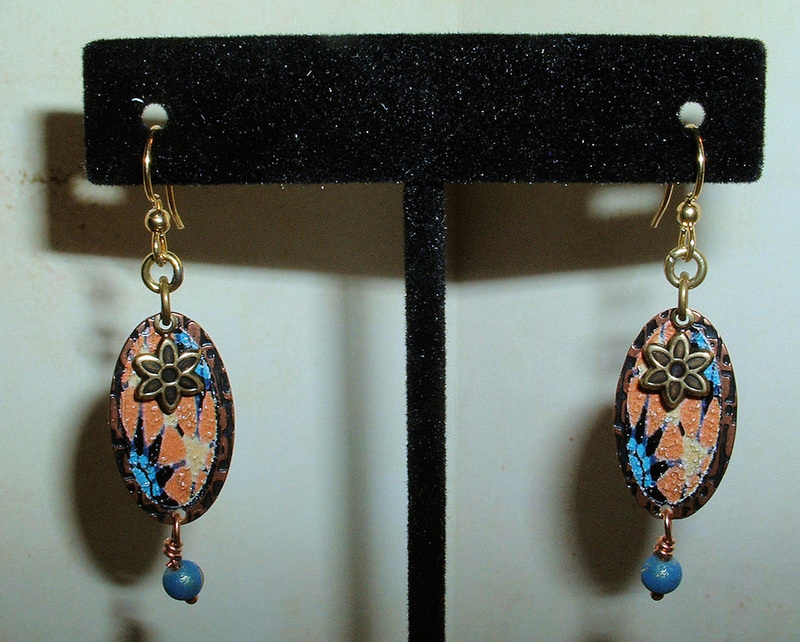 Finished with an antique brass daisy and round Turquoise beads. 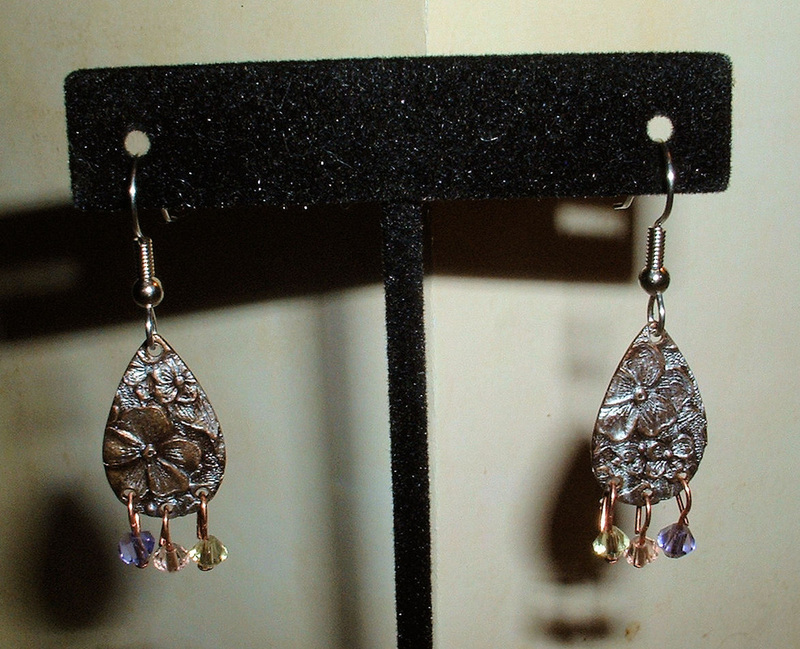 Laser etched Copper Mint leaves are surrounded by petals of Aquamarine and Faceted Amethyst. Sterling components & findings. 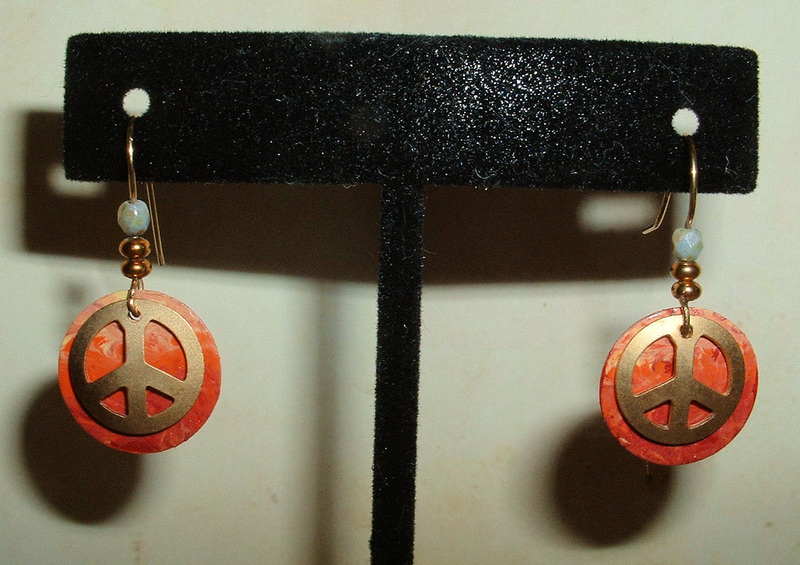 Enameled Copper disc layered with Laser cut brushed Gold Peace Signs. Round Gold and Faceted Labradorite beads. 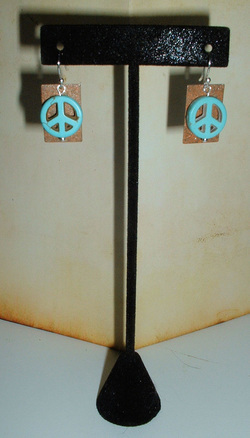 Close Up: New Peace Earrings. 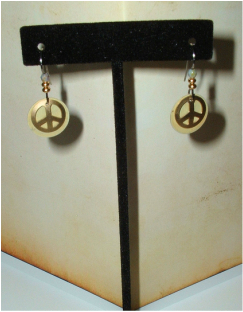 Sage enameled Copper disc layered with Laser cut brushed Gold Peace Signs. Round Gold and Faceted Labradorite beads. 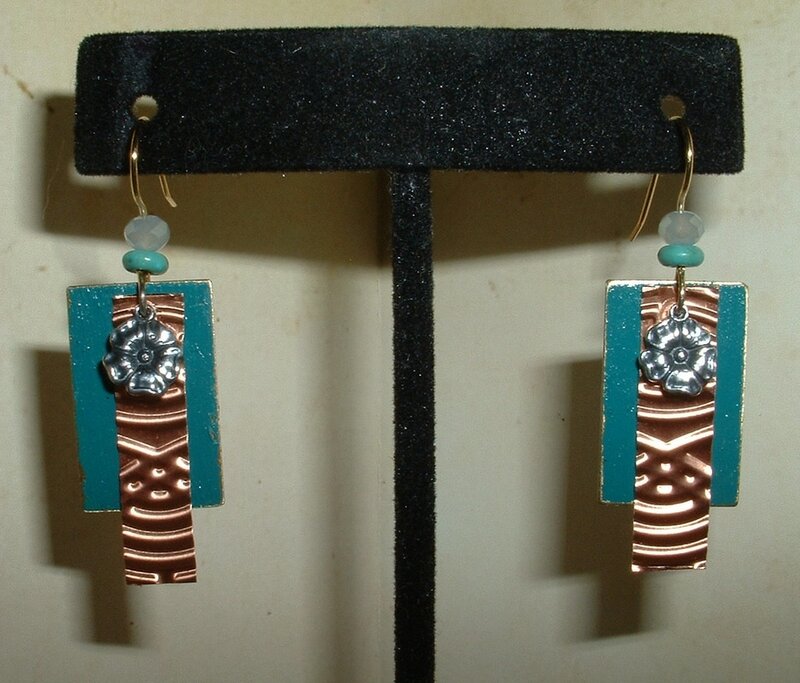 Hand Painted iridescent brown on Bronze rectangle drops layered with genuine Turquoise carved Peace Sign Charms. Sterling components. 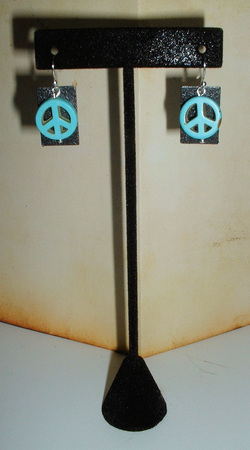 Hand Painted iridescent black on Bronze rectangle drops layered with genuine Turquoise carved Peace Sign Charms. Sterling components. Laser etched and silkscreened orbital design on brass. Gold, Citrine and wooden beads. 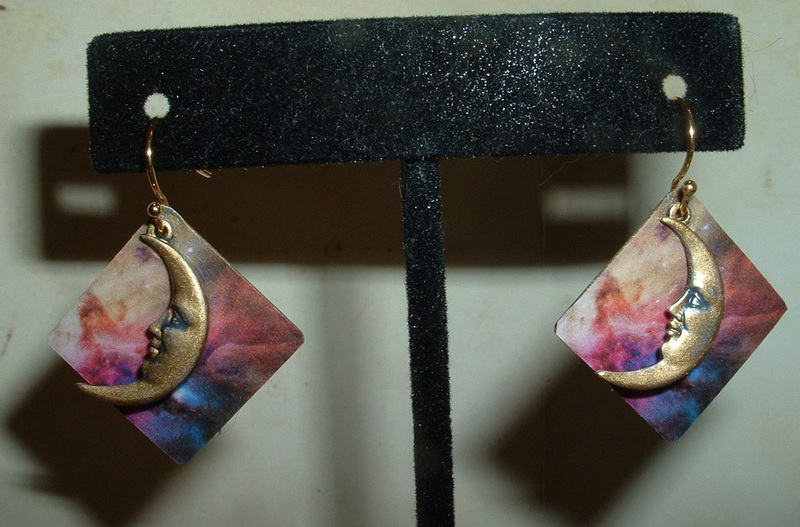 Lithographed artisan rendering of the night sky on Bronze rectangular drops. Layered with Sterling Moon Charms. Lithographed artisan rendering of a nebula cloud on Brass diamond drops. 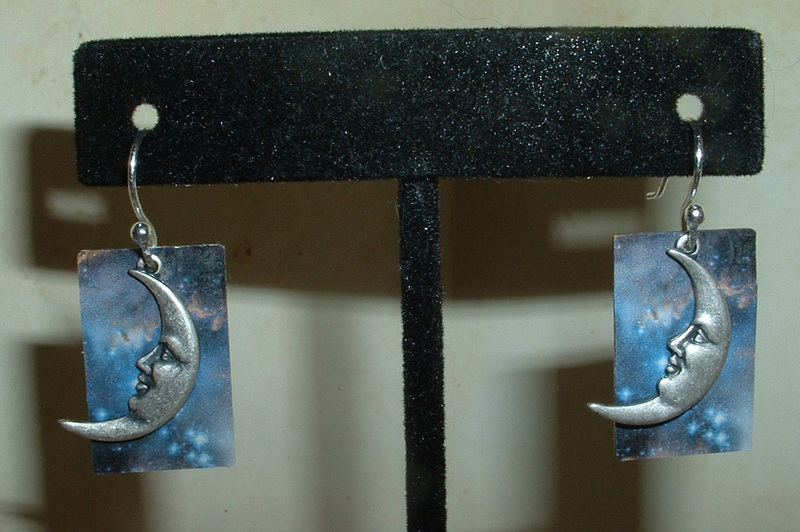 Layered with hand burnished 10k Gold Leaf Sterling Silver Moon Charms. Lithographed artisan rendering of an asteroid on brass discs w/gold leaf finish. Layered with a gold leaf star. Sterling silver halo, angel wings & findings. 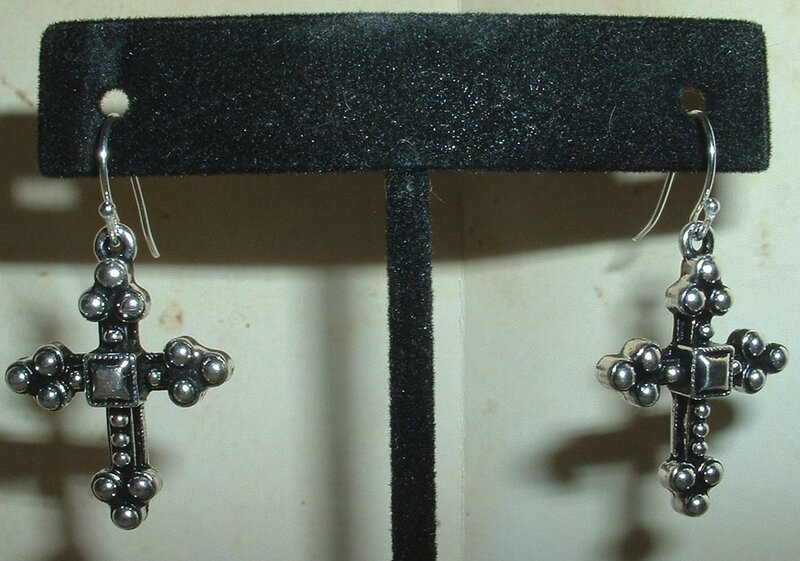 Sculpted Bali design Sterling Silver budded crosses. 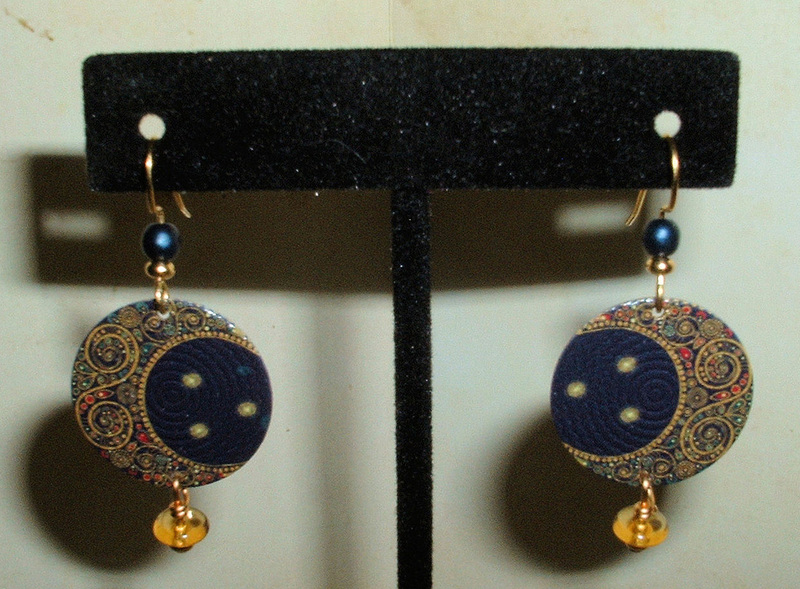 Close Up of Byzantine Earrings. 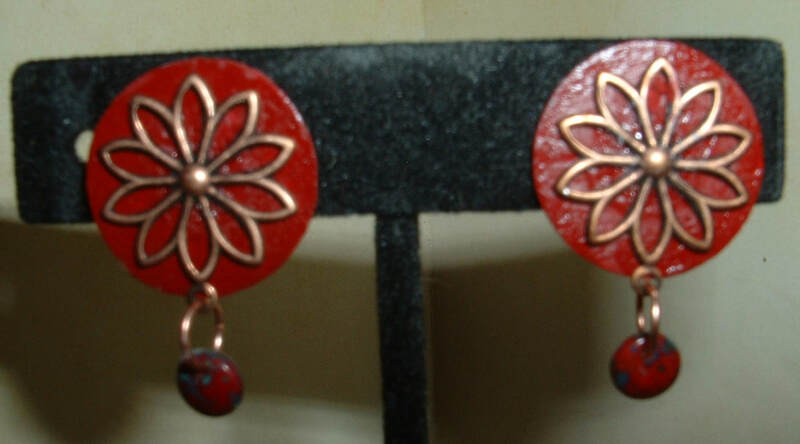 Garnet enameled Brass drops layered with laser cut Copper daisy design. 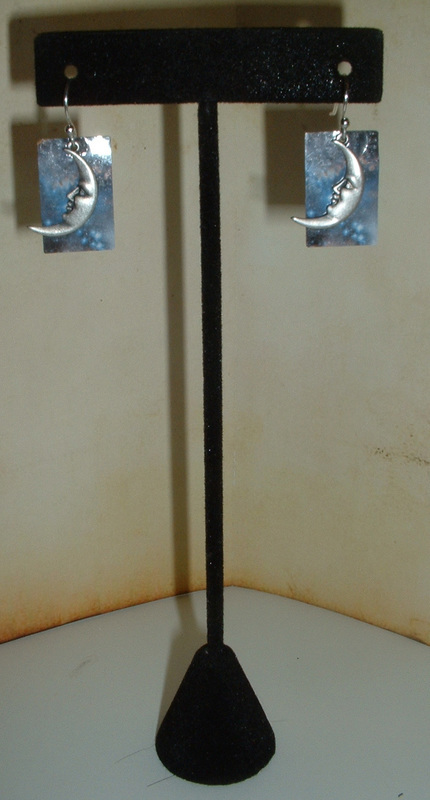 Close Up of Monoptilon Earrings. 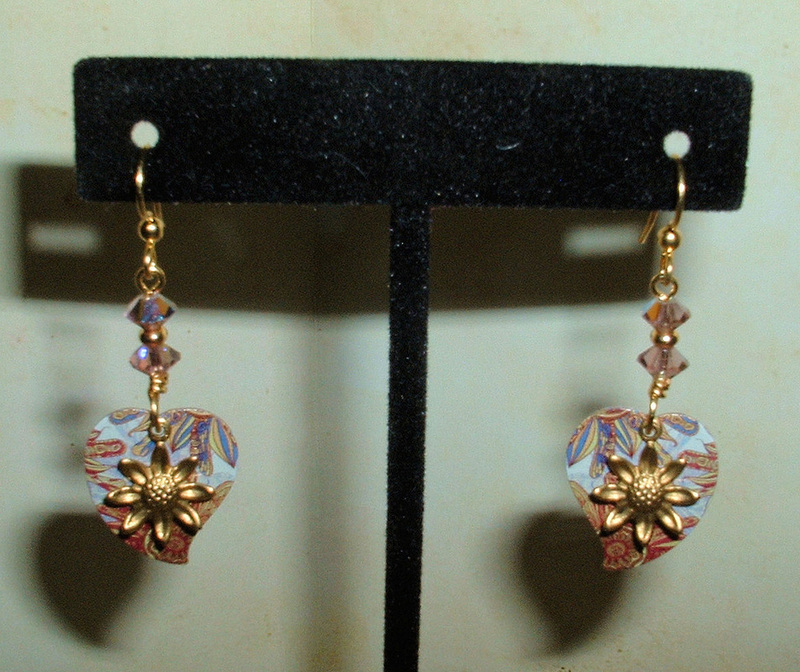 Enameled Brass drops layered with embossed Copper strips & sculpted Sterling hibiscus flowers. 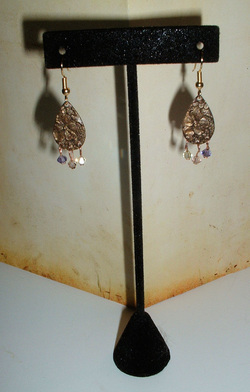 Sculpted 10k Gold floral vine drips with Swarovski crystal flower cut beads. Enameled artisan rendering on laser etched Brass, faceted Peridot beads, 14k gold filled wirework. 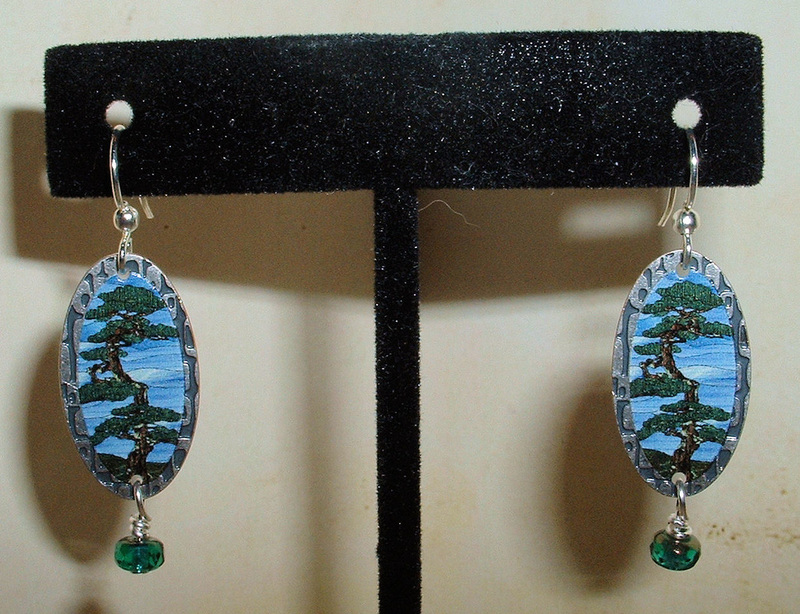 Enameled artist rendering on laser etched Stainless Steel, Iron wire work, round Pearl beads. Laser etched silver layered with silkscreened daisy design on brass. Silver Eternity Ring. Silver, Pearl & Smokey Quartz beads. Enameled artisan rendering on laser etched Stainless Steel, faceted Alexandrite beads, Sterling wirework. 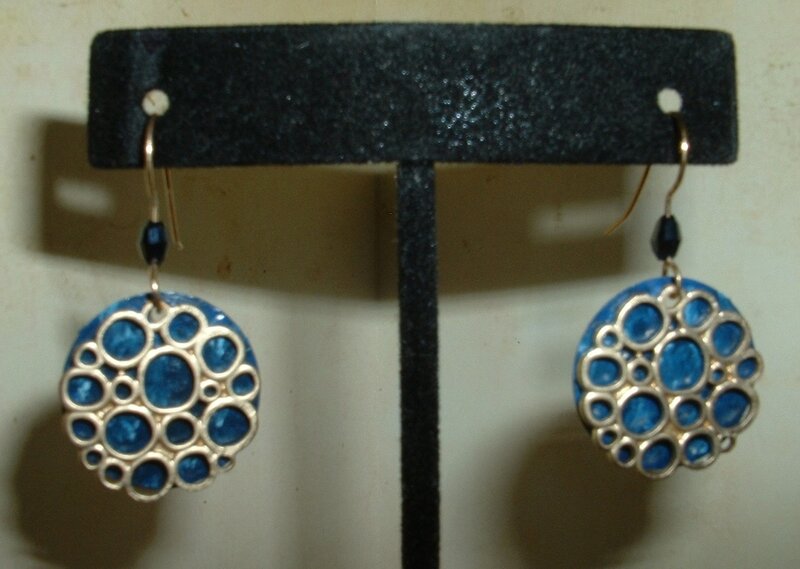 Enameled Brass discs layered with crazed Sterling diamond drops and Bronze charms. Bronze & Stainless beads. 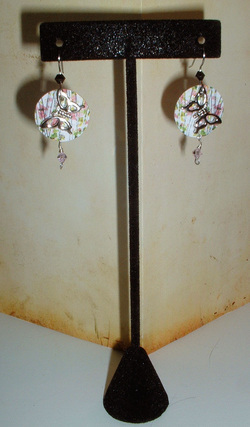 Close Up of Orchid Earrings. 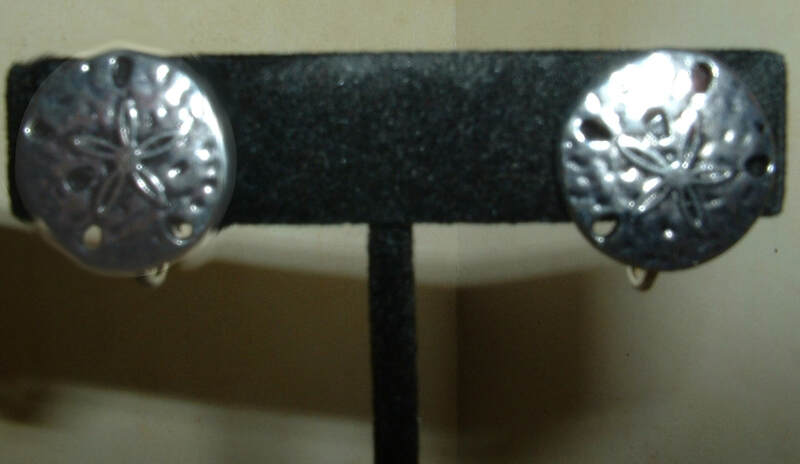 Close Up of Daisy Drop Earrings. findings hold a Tiger's Eye Cabochon in place on each earring. 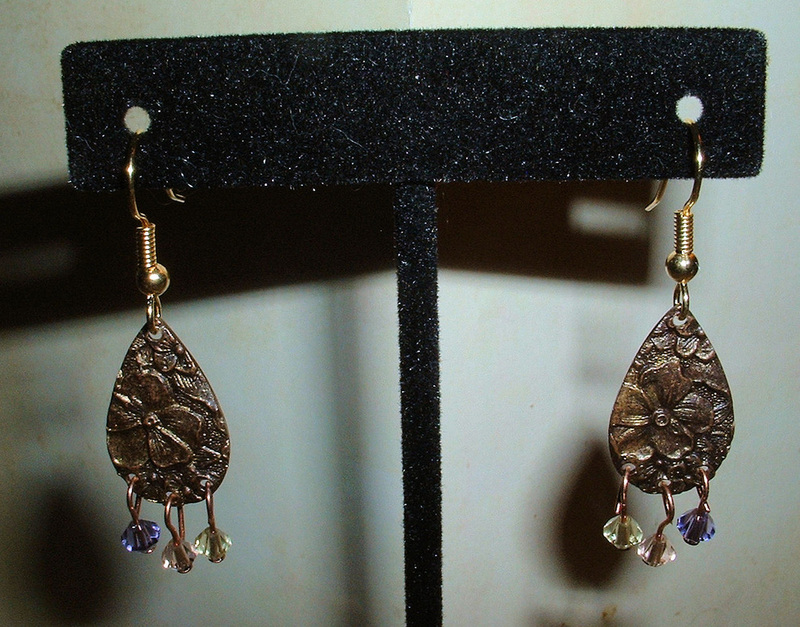 Embossed gold leaf bronze drops with copper components. Swarovski Amethyst, Peridot and Rose & gold beads. 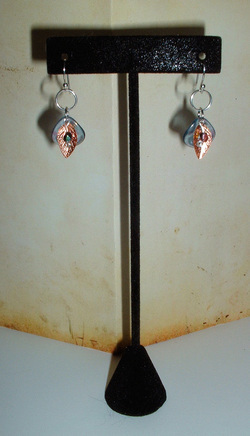 Embossed silver leaf bronze drops with copper components. Swarovski Amethyst, Peridot and Rose & Sterling beads. 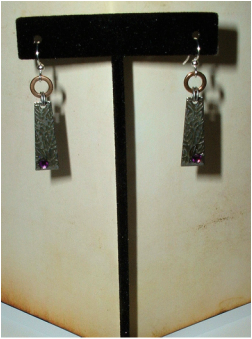 Laser Engraved steel shape adorned with an Amethyst Crystal. 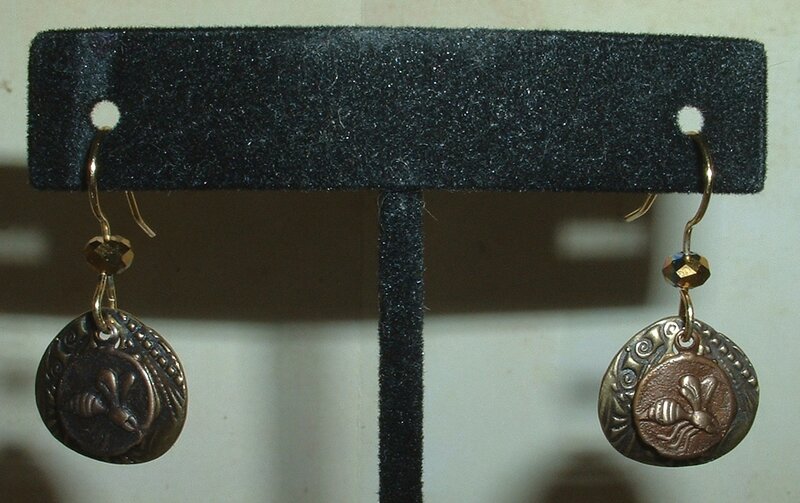 Pewter findings hold in place a Solid Copper Eternity Ring on each earring. 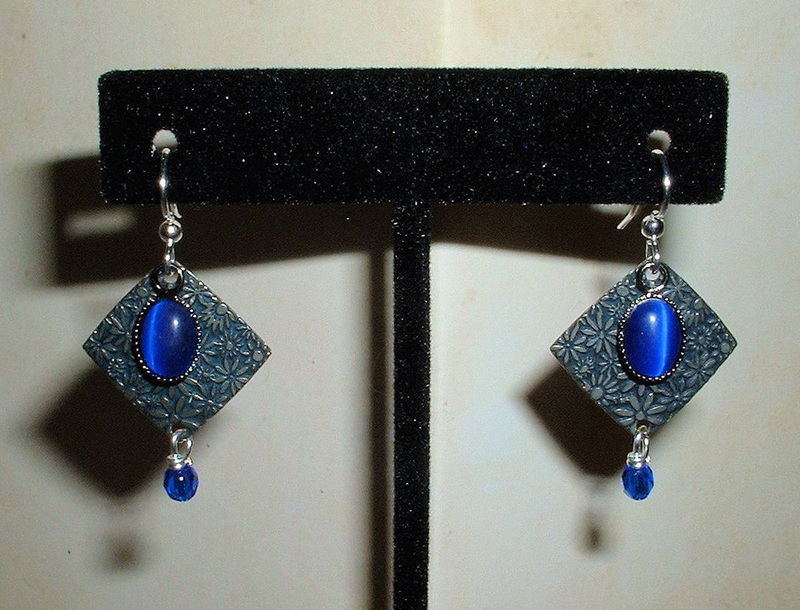 Sapphire enameled & embossed Stainless rectangles layered with sculpted Sterling filled Seahorse charms. 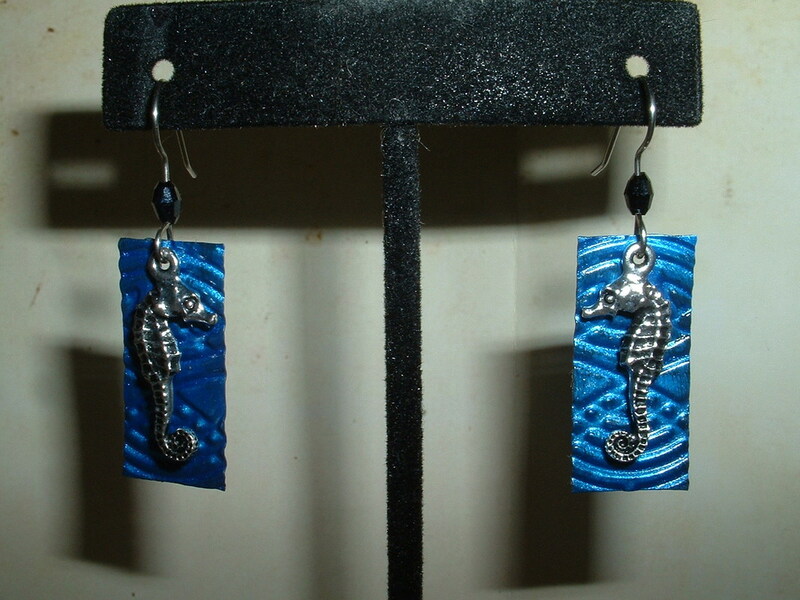 Close Up of Seahorse Earrings. Faceted Dark Blue Tourmaline beads. 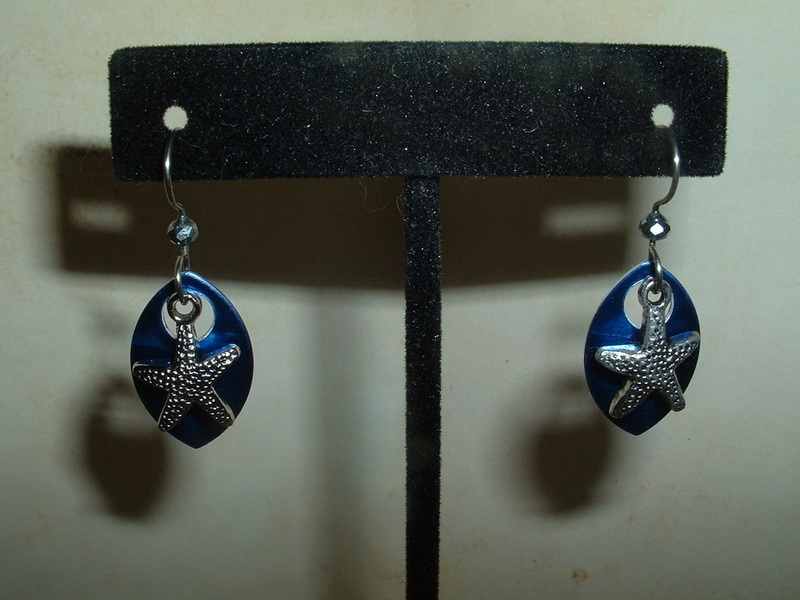 Powder coated Aluminum drop layered with Stainless Starfish charm. 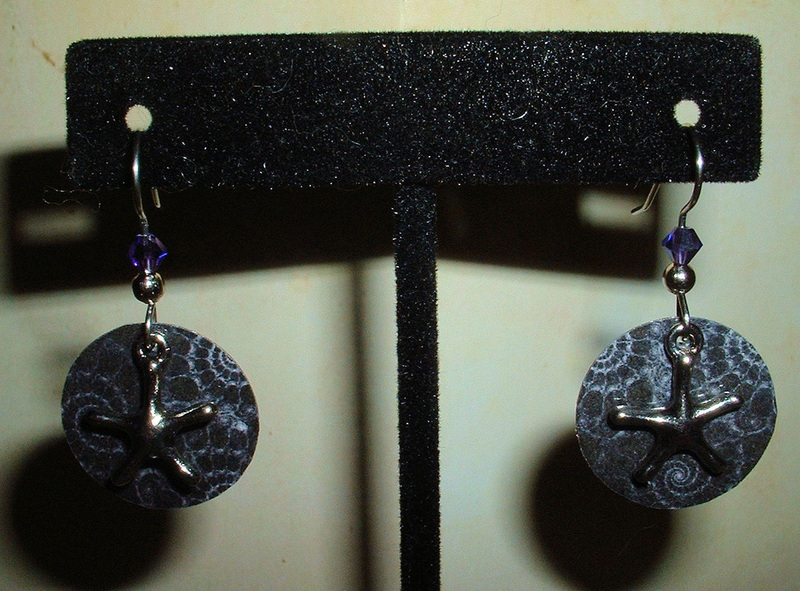 Close Up of Starfish Earrings. 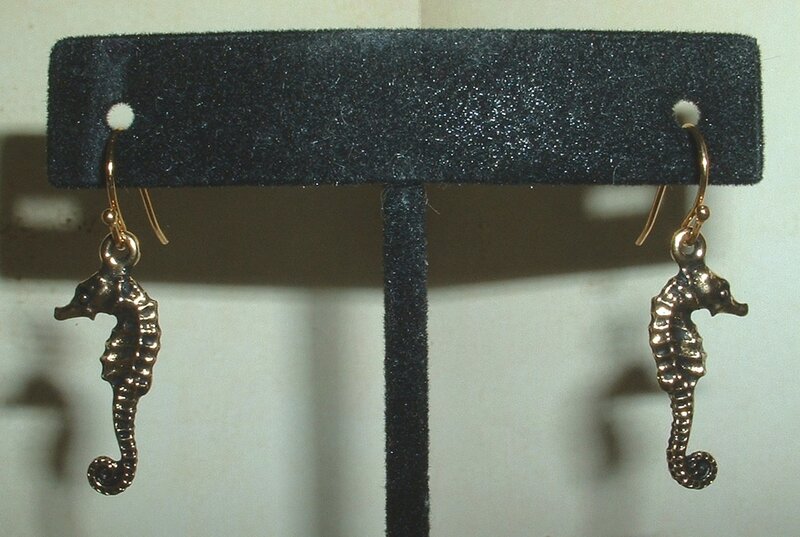 Sculpted 22k Gold filled Seahorse charms. 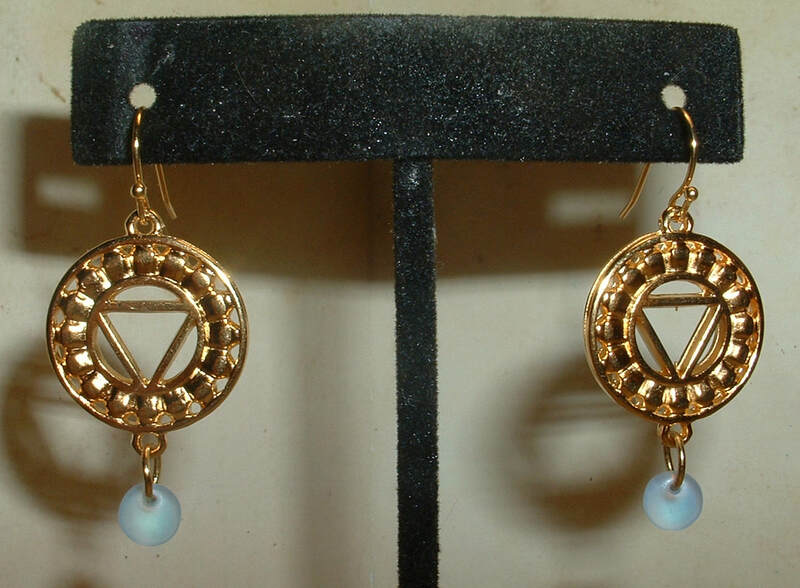 Close Up of Golden Seaponie Earrings. Sterling Silver hand created & hammered wire work design. Sliced Conch Shell beads. 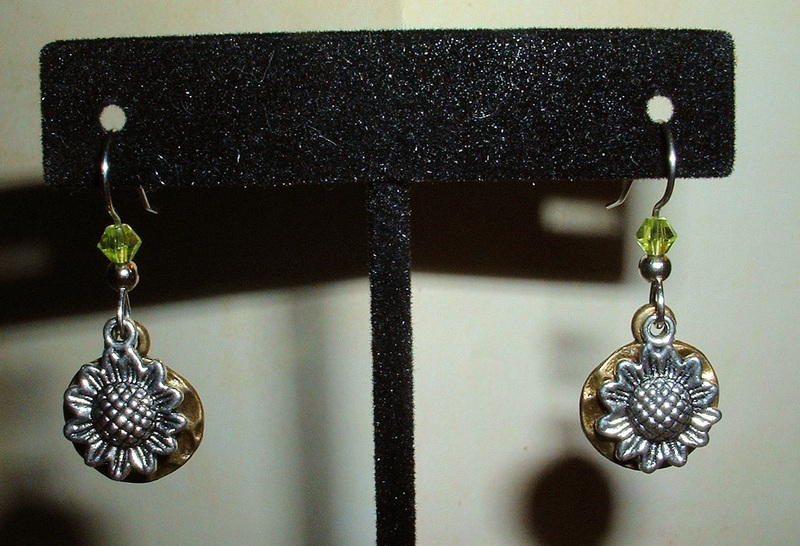 Lithographed Artisan rendering of the inside of conch shells on brass, layered w/Silver starfish charms. Swarovski Amethyst & Sterling beads. 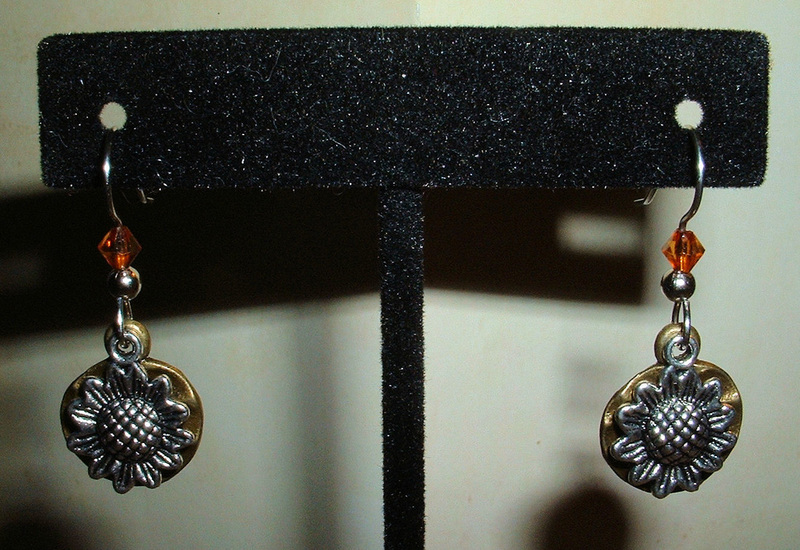 Sterling silver sunflowers layered with hammered Gold drops, round Sterling & faceted Swarovski Topaz crystal beads. Close Up: Topaz Ya, Ya! 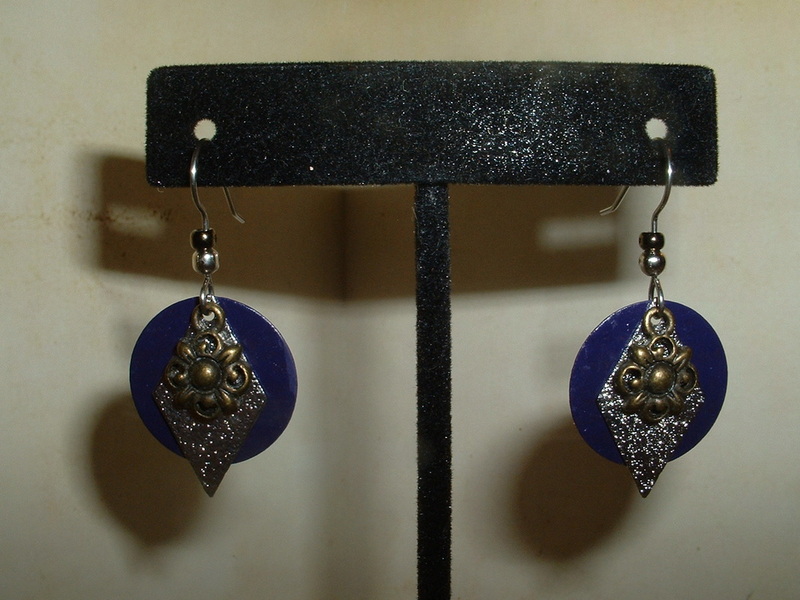 Earrings. 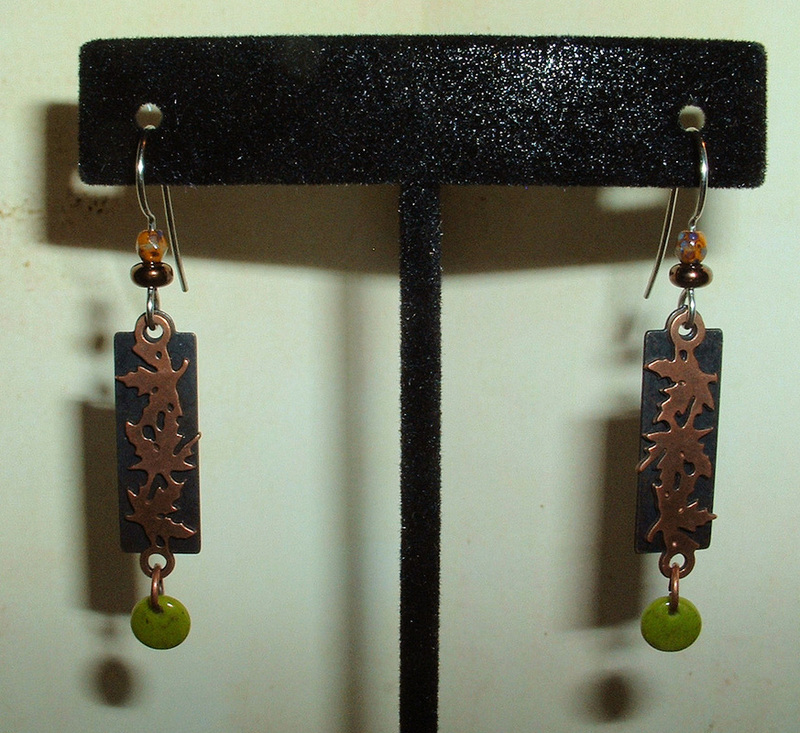 Laser cut bronze leaves in a stacked design, layered with a bronze drop earrings. 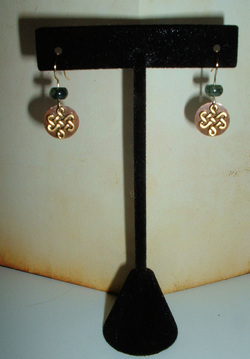 Finished with round bronze and faceted Serpentine beads & Gaspeite drops. 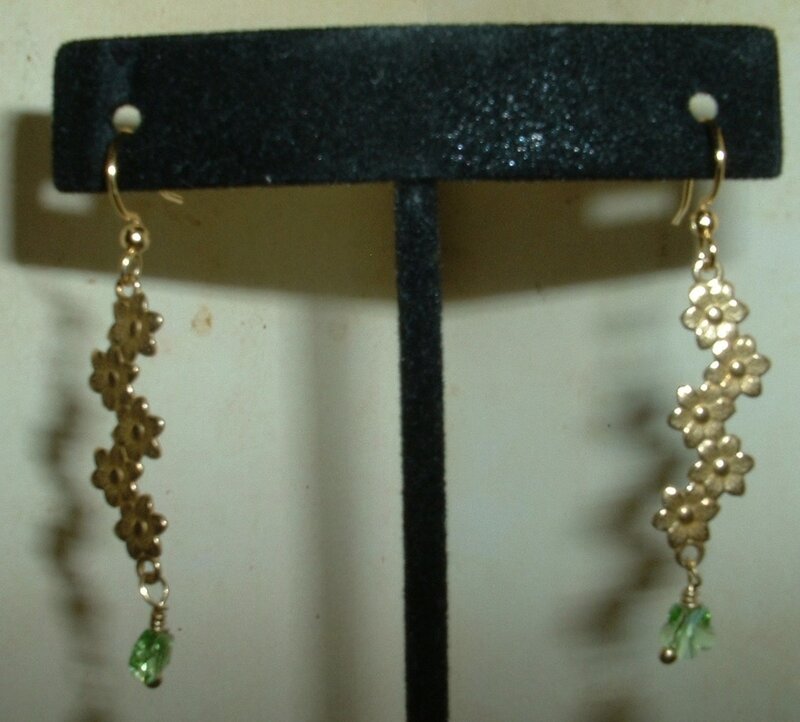 Sterling silver sunflowers layered with hammered Gold drops, round Sterling & faceted Swarovski Peridot crystal beads. Close Up: Peridot Ya, Ya! 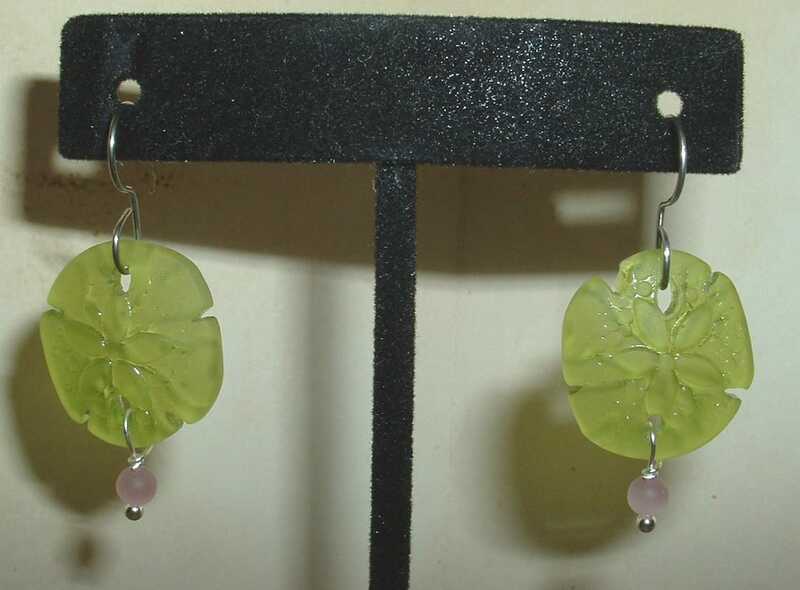 Earrings. 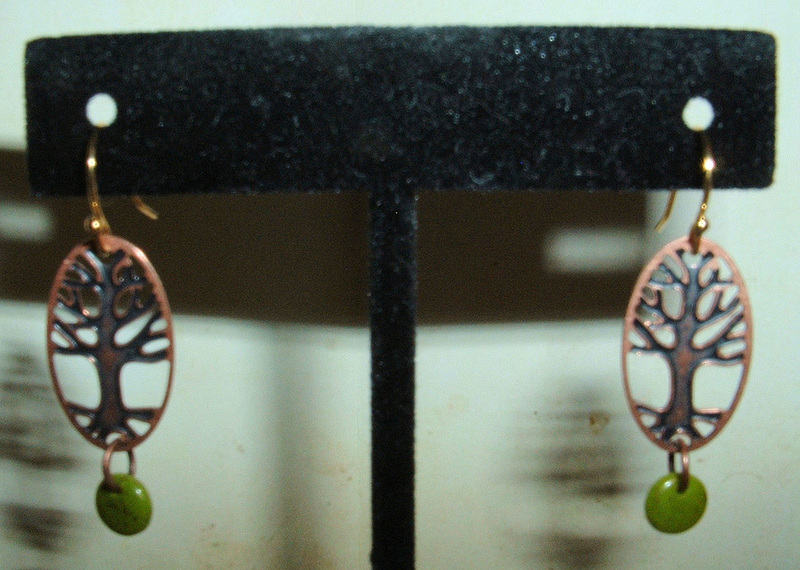 Laser engraved copper tree design layered with a sage enameled copper disc earrings. Finished with round gold & maw-sit-sit and faceted amazonite beads. Close Up: Tree of Knowledge. Enameled brass disc layered w/laser engraved copper design, faceted Diaspore, Cassiterite and Copper beads and copper components. Laser engraved Brass treetop design layered with Sterling charms. 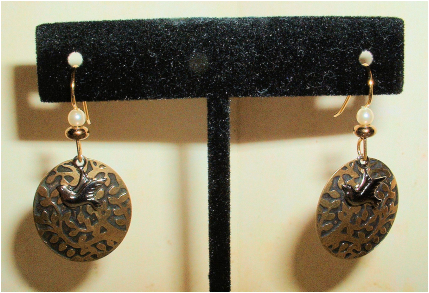 Round Pearl & Bronze beads. 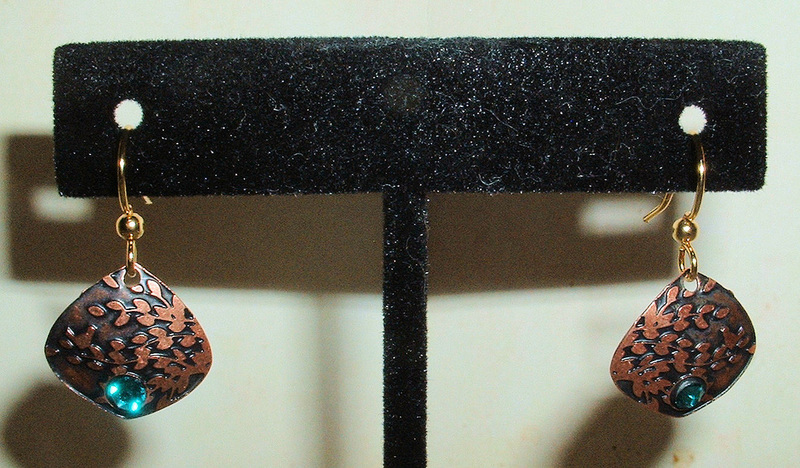 Close Up: Morning Dove Earrings. Laser cut & laser engraved Copper tree design, Bronze links connecting to tumbled Chrysoprase drops. 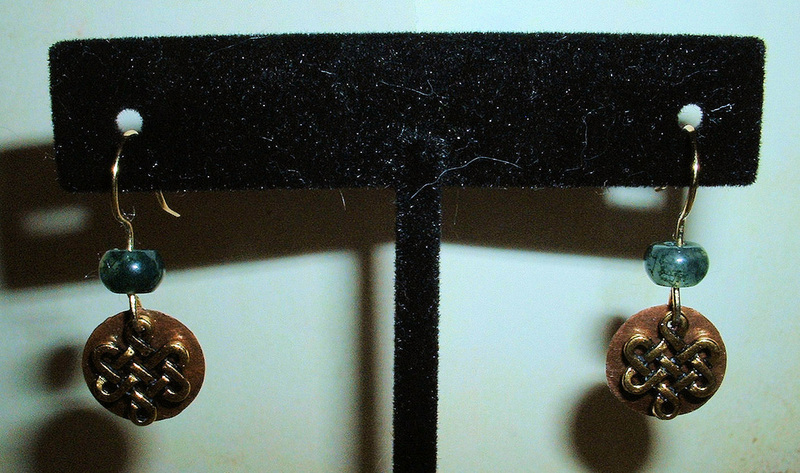 Close Up: Mighty Oak Gold Earrings. Laser engraved design on Copper, fitted with Aqua Swarovski crystals. 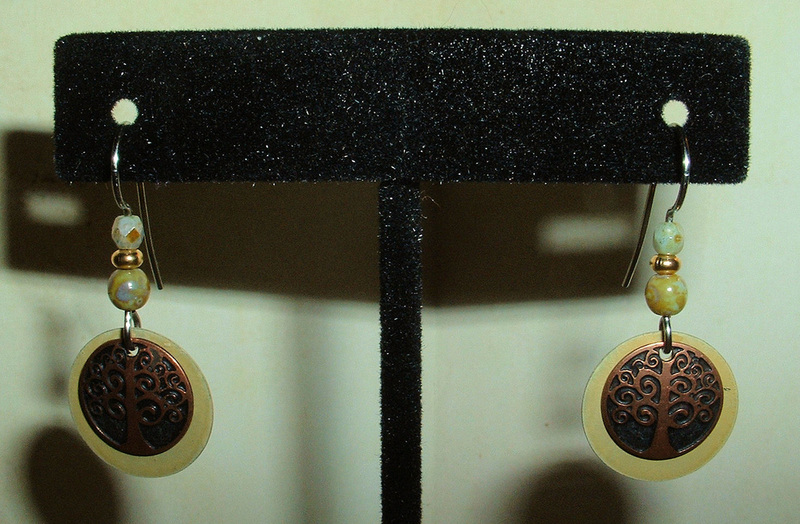 Close Up: Honey Wheat Aqua Earrings. 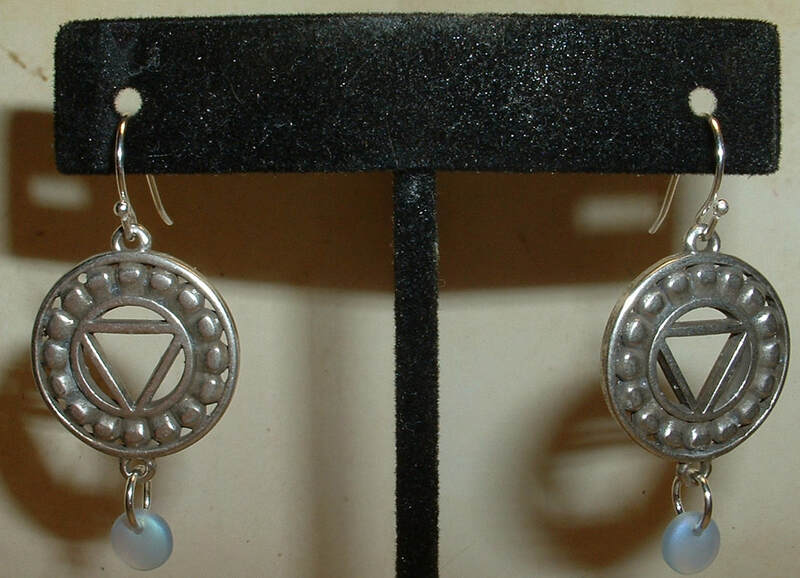 Enameled artisan rendering on laser etched Stainless Steel, faceted Iolite beads, Sterling wirework. 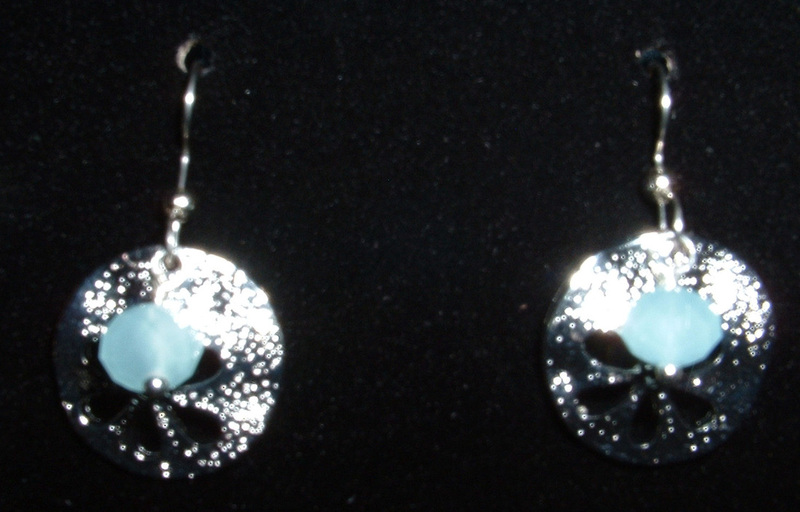 Close Up: Ice Flowers Earrings. Laser engraved silver with a hand painted design, silver eternity ring and Ametrine beads. 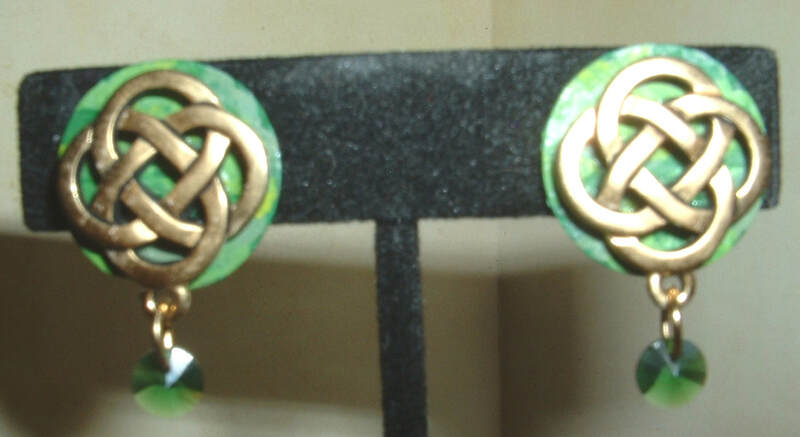 Shades of green enameled gold discs layered with 22k Gold filled elemental knots. 10k Gold filled clip-on hardware. 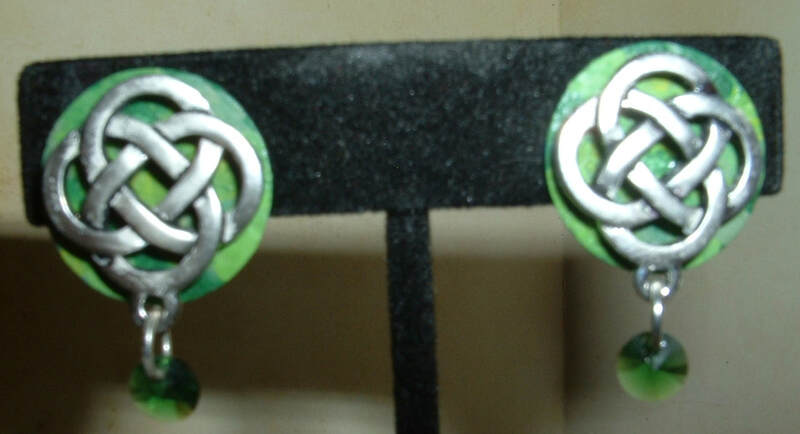 Shades of green enameled sterling discs layered with Sterling filled elemental knots. Laser engraved antiqued 10k Gold jardin style drops. 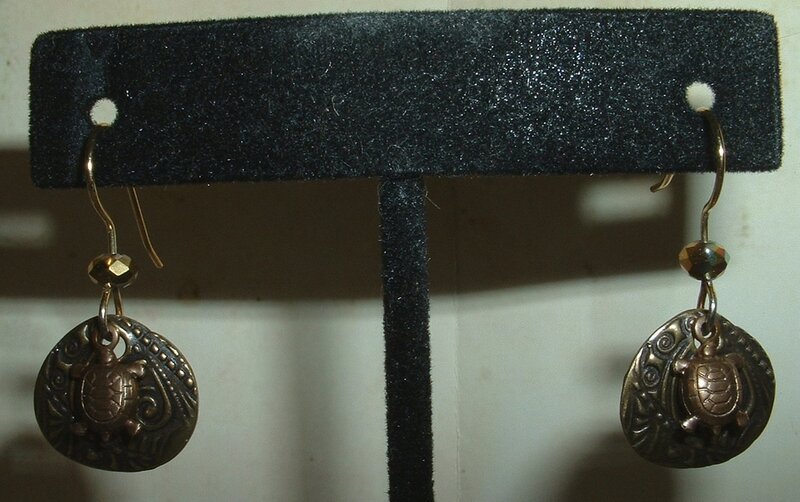 Laser engraved antiqued Sterling jardin style drops. 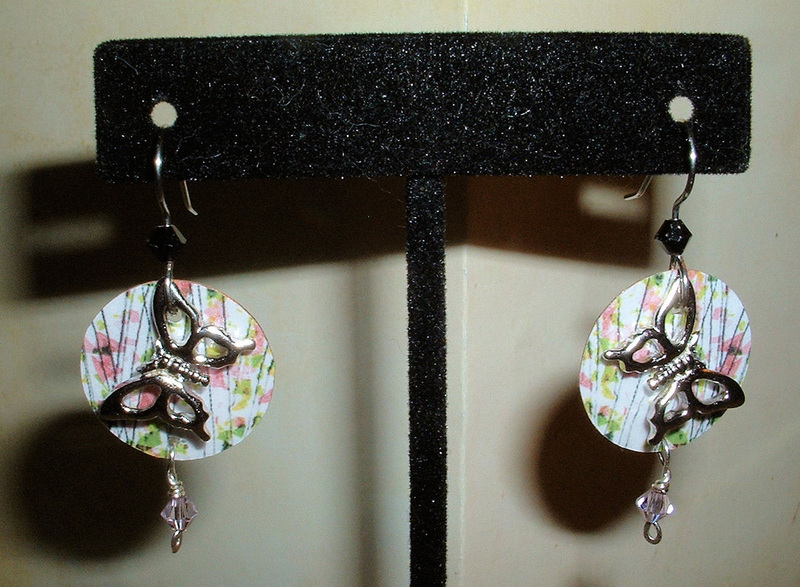 Rose Quartz Swarovski butterflies beadwork. 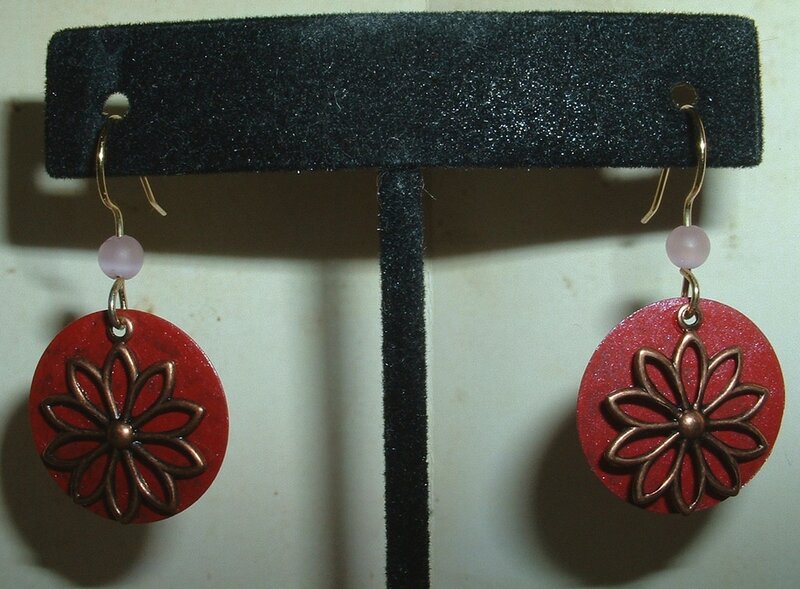 Burgandy enameled 10k Gold discs layered with laser cut Copper daisy design. Laser cut & laser engraved Sterling sand dollar design.